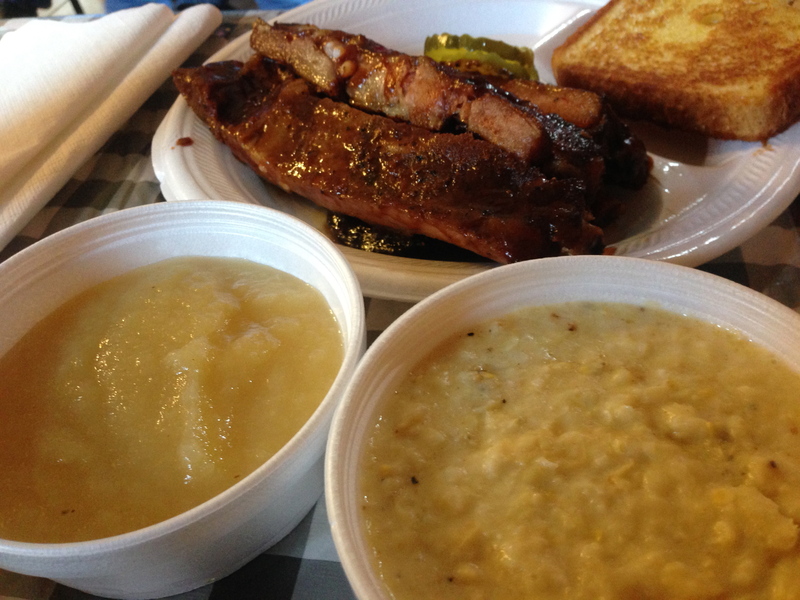 We have made many trips to “The Classic City” in the last six months and thought we would take a time out from our weekly dates to share some of the fun with our readers. It’s hard to find a bad meal in Athens, and we are happy to report that we ate some splendid food. 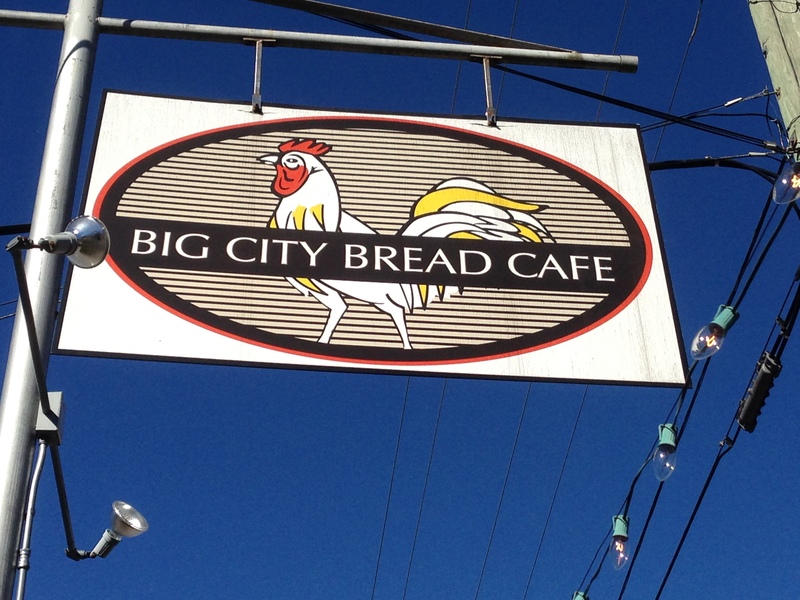 Starting with breakfast, don’t miss Big City Bread. On the weekends, the lines start forming around 10AM, so if you sleep late, expect a wait, but it’s worth it. Sit outside if the weather is nice. You can go healthy with egg whites in your spinach and mushroom omelette. Or go French with some manly quiche. 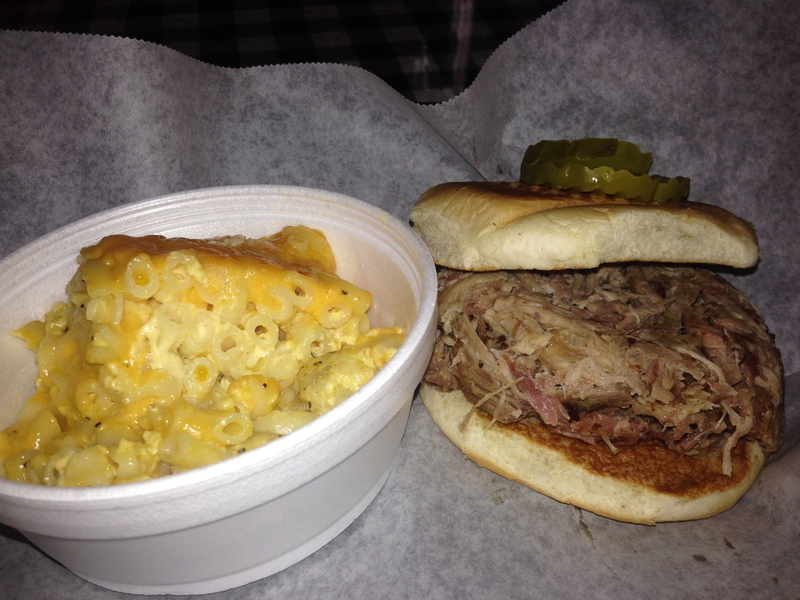 The lunches at Big City are as good as the breakfasts. 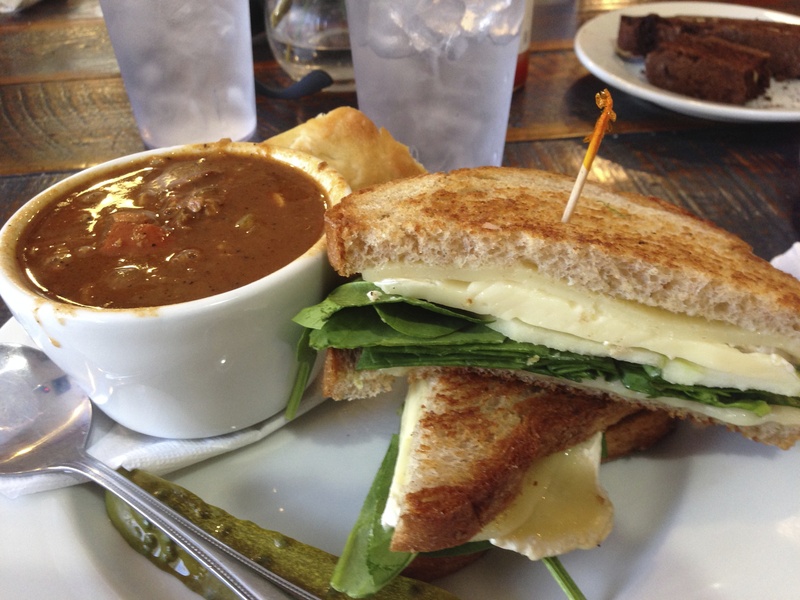 The grilled cheese has gruyere and provolone. It comes with a bowl of spicy gumbo, which is the side of the day today. I would have liked the cheese melted a little more. We try two other sandwiches. The turkey is tasty, and quite healthy as well. The peach preserves on it are a nice touch. This one isn’t as healthy. 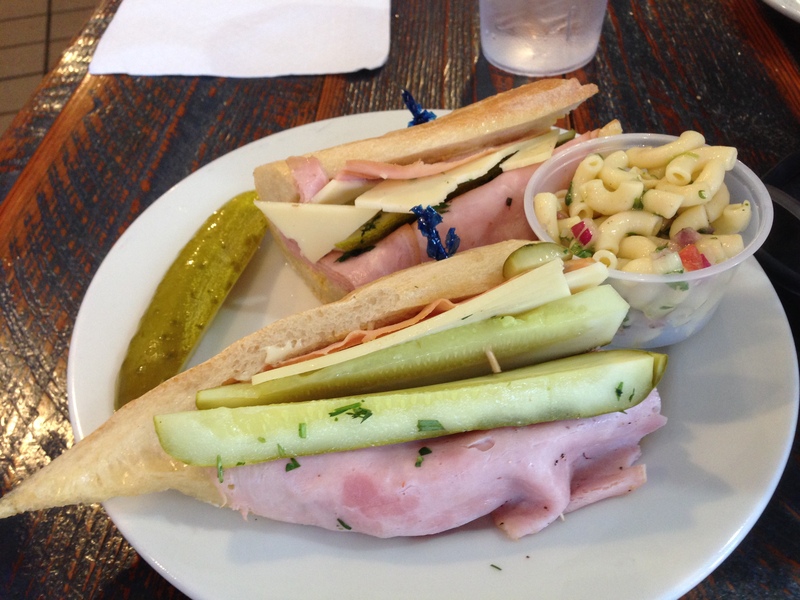 The French ham and cheese is exactly that and comes on a baguette to boot. Oooh-la-la! We dare you to pass by this case without buying something. If you can, your will power is much better than ours! Staying in the breakfast/lunch mode let’s look in on the Athens Bagel Co.
Like Big City Bread, you wait in line and they bring you your food. The bagels are fresh and there are many varieties to choose from. If you look behind the curtain, you can see “The Wizard” making the bagels. 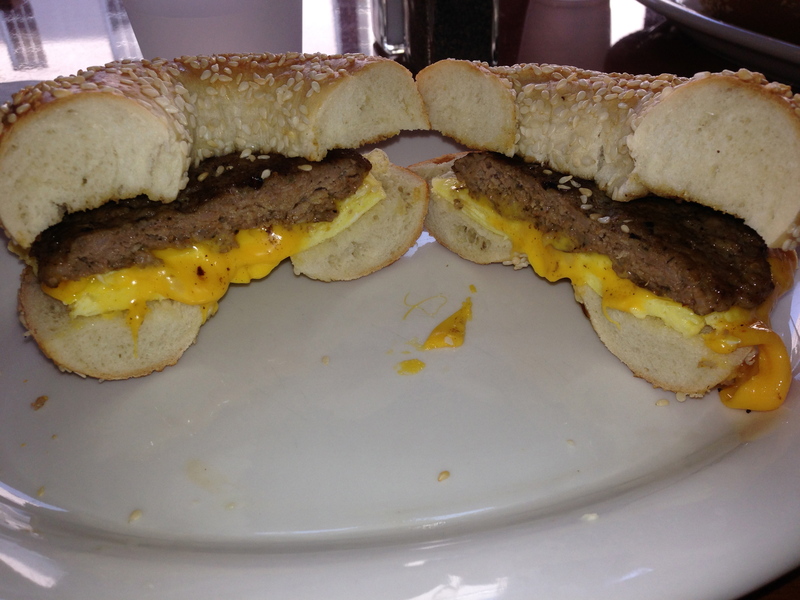 The egg and sausage sandwich comes with egg and Stripling’s sausage. It’s really good sausage and it makes this sandwich. 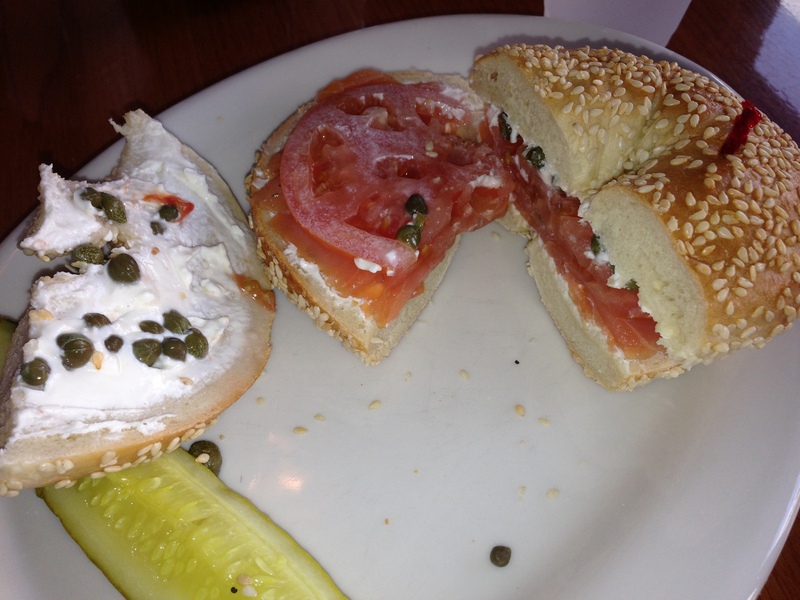 Traditionalists can go for the lox and bagel sandwich. It comes with cream cheese, tomato, and capers. Good stuff. Our vegetarian/vegan friends will love The Grit. Wait, do we have any vegan friends? It’s a little outside of downtown, but worth the walk. We really like the food here, but we seem to have a dilemma when we visit: either the wait staff has problems or the kitchen is backed up and it takes forever to get your food. 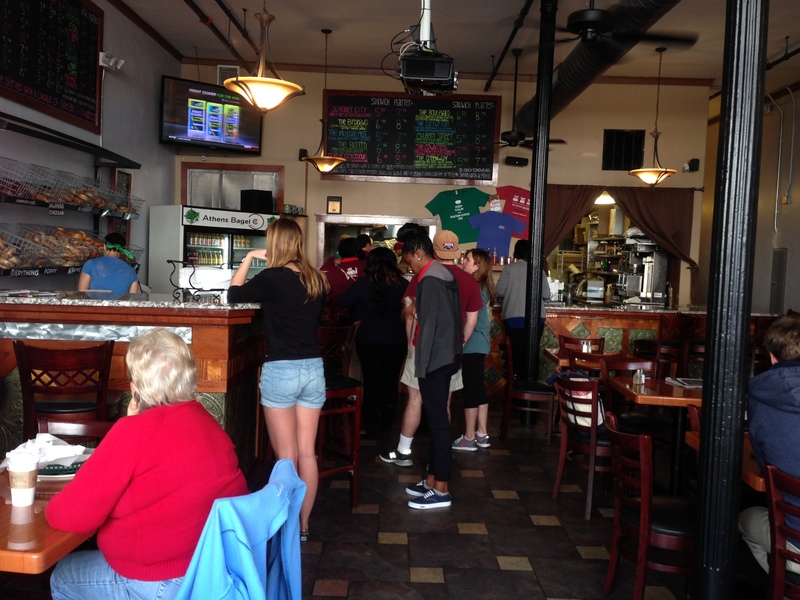 On a recent visit, we wait over 25 minutes before anyone comes to take our order. We notice that there is only one server handling the entire dining room. The moral of the story is don’t visit here if you are in a hurry. 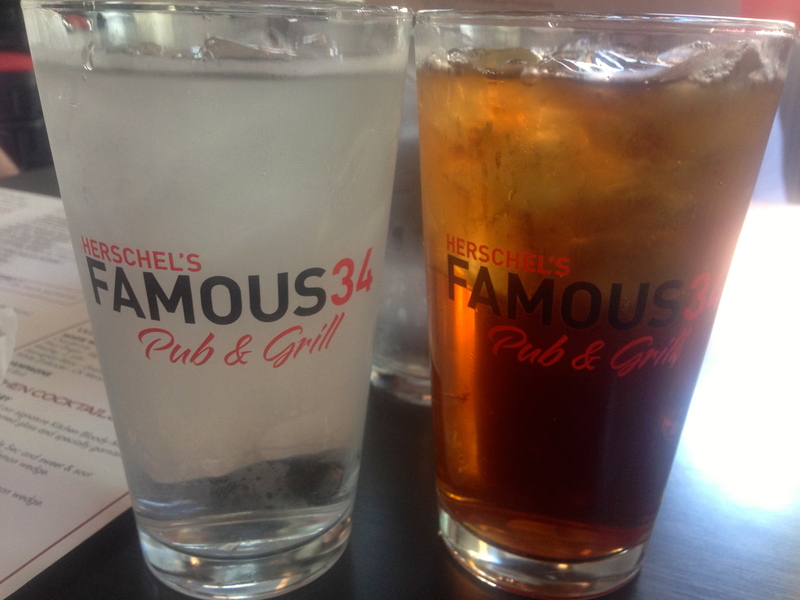 We order both specials. 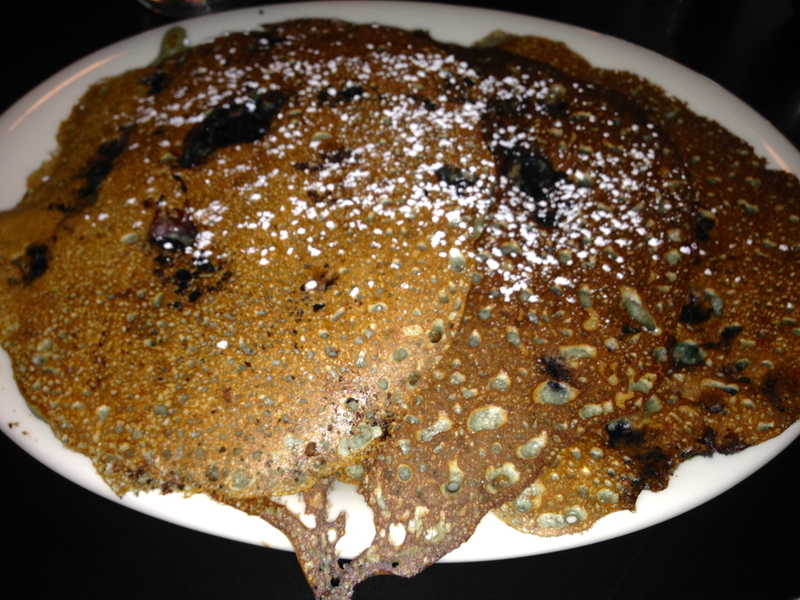 First up is the blueberry pancakes, a HUGE order of pancakes, bursting with blueberries. You could easily share this with a friend. We also get a spinach, tomato and cheese omelette. 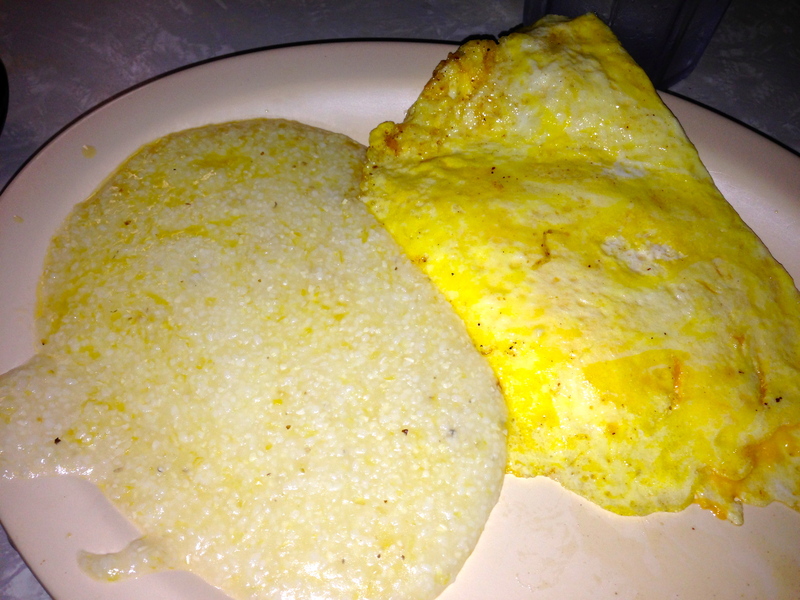 It was supposed to come with grits, but they are out of grits at 10:30. 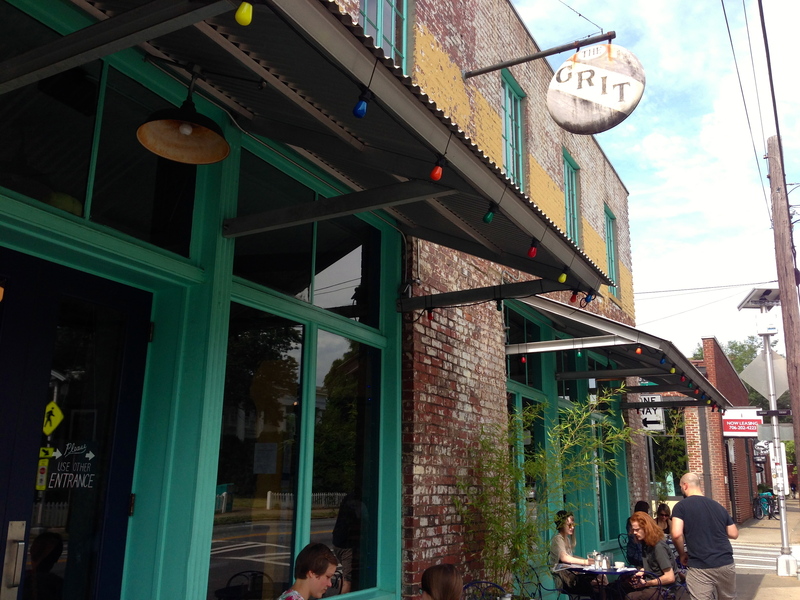 No grits at The Grit. They change it to potatoes, but they are out of them too. 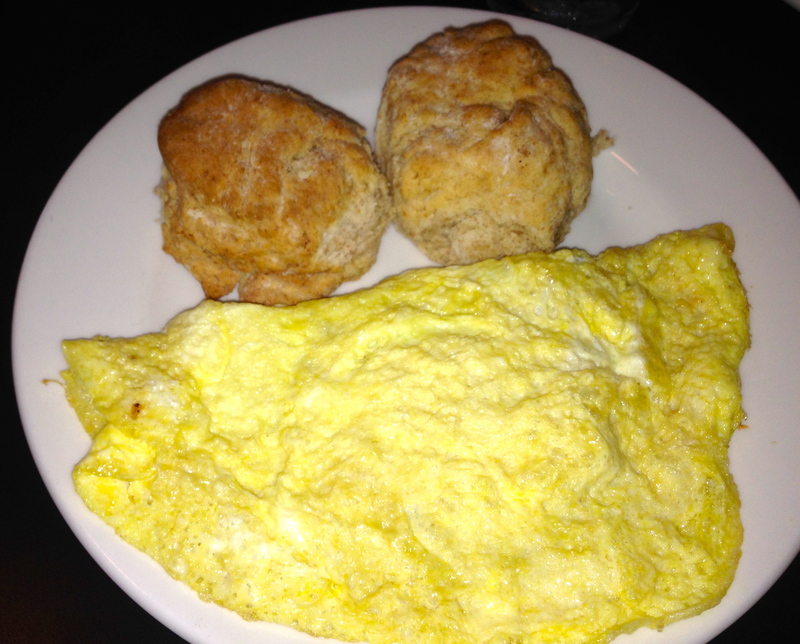 They bring it to us with an extra whole wheat biscuit instead. It’s always something here. It’s a very laid back, hippie-style atmosphere, and it’s hard to get uptight with their problems. The Mayflower has been around since 1948. If central casting needs a place to shoot a 1940’s movie, this is the place. 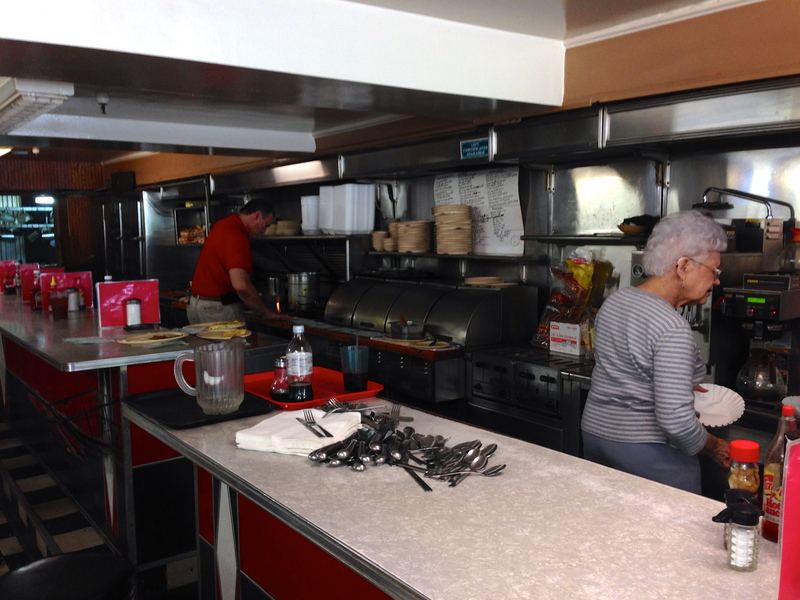 From the tables, to the grill, to some of the staff, not much has changed here for over 60 years. 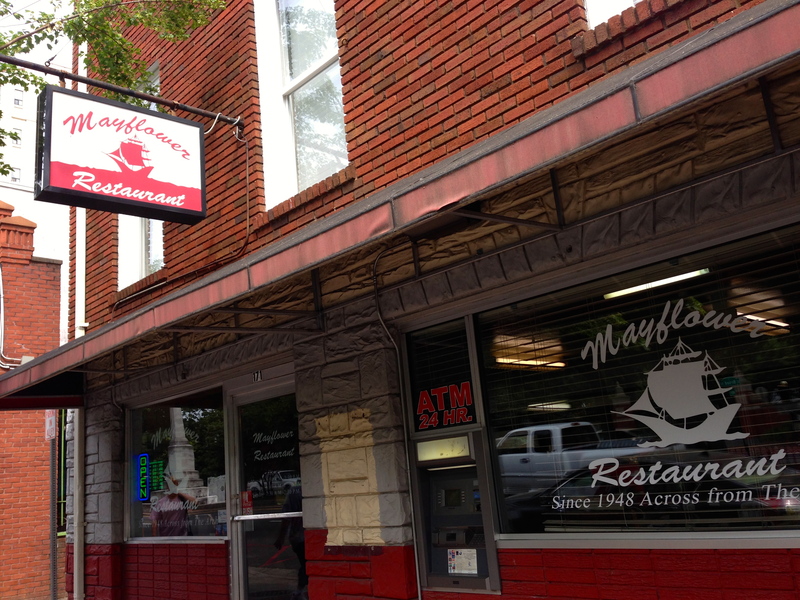 The Mayflower is open for breakfast and lunch. Or you can get lunch for breakfast. We all go for eggs. 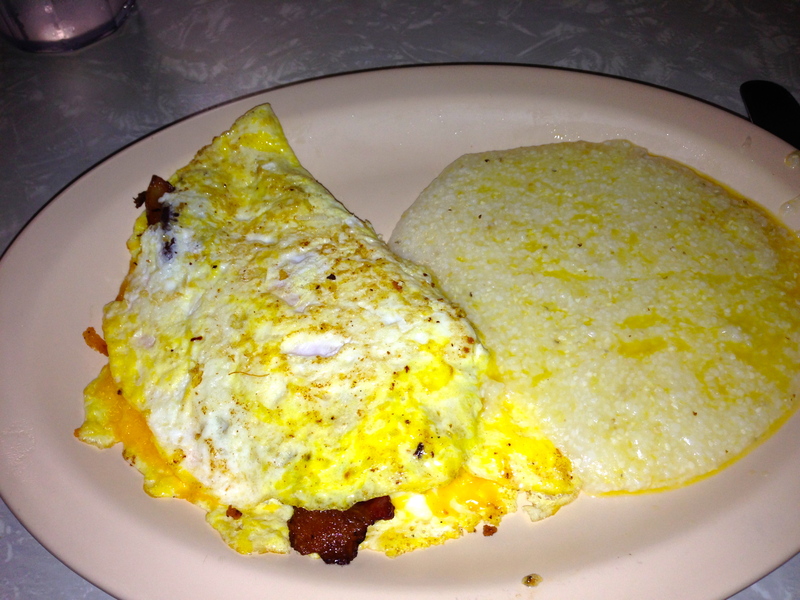 The bacon omelette has slices of bacon folded inside of the eggs. Eve would have liked them better crumbled, but it’s nice to see freshly grilled bacon inside of there. I get a cheese omelette. Pretty boring, but it’s good. 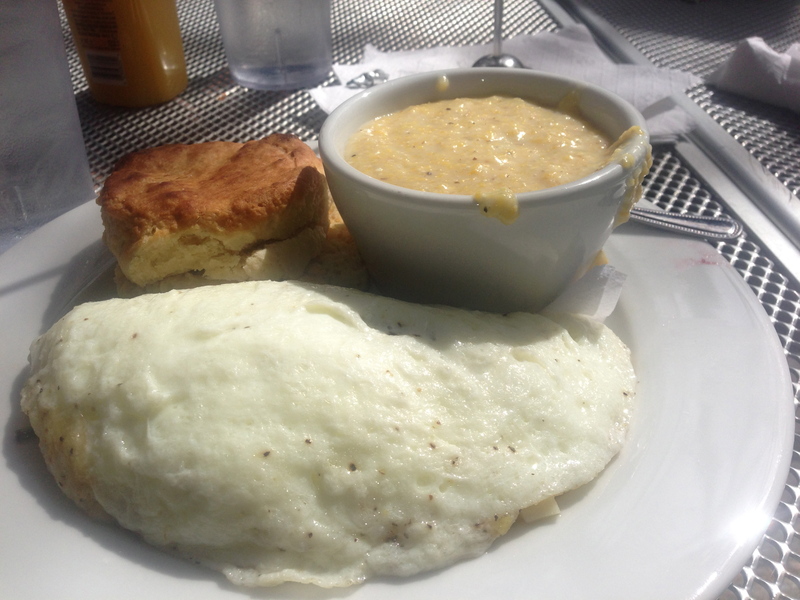 Notice that we got grits here, which were not available at The Grit. Here’s another omelette, the sausage and cheese. 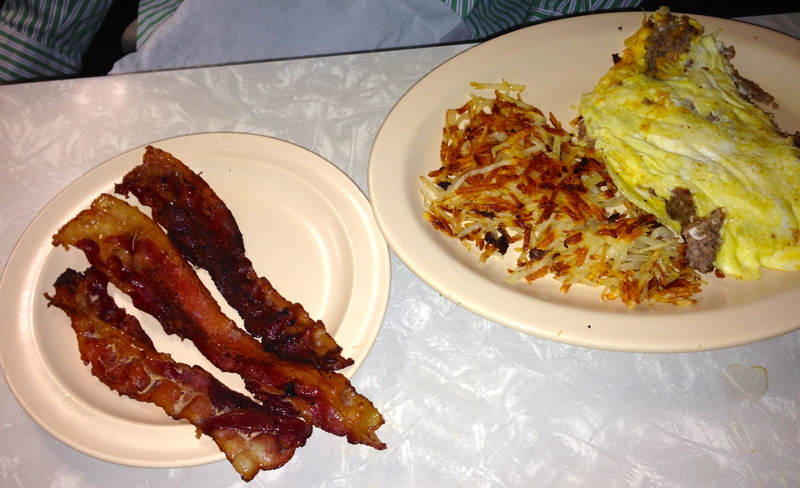 With a grill like they have here, you might want to try the hash browns. The Grit was out of those too. 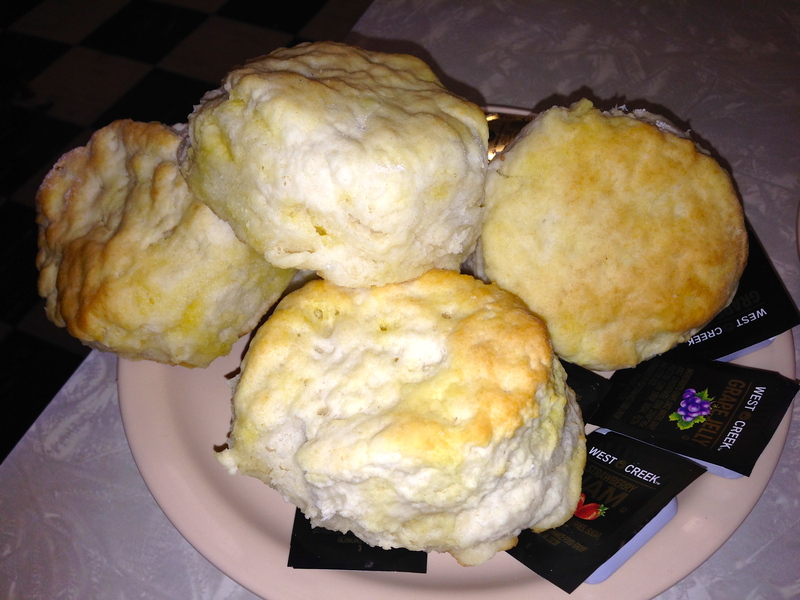 Besides the vintage vibe, here’s the reason you want to come here–the biscuits. Look at these guys. We can’t imagine how much butter must be in them. Yes, they are as good as they look. There are two left over and we forget to bring them home. Bad move. 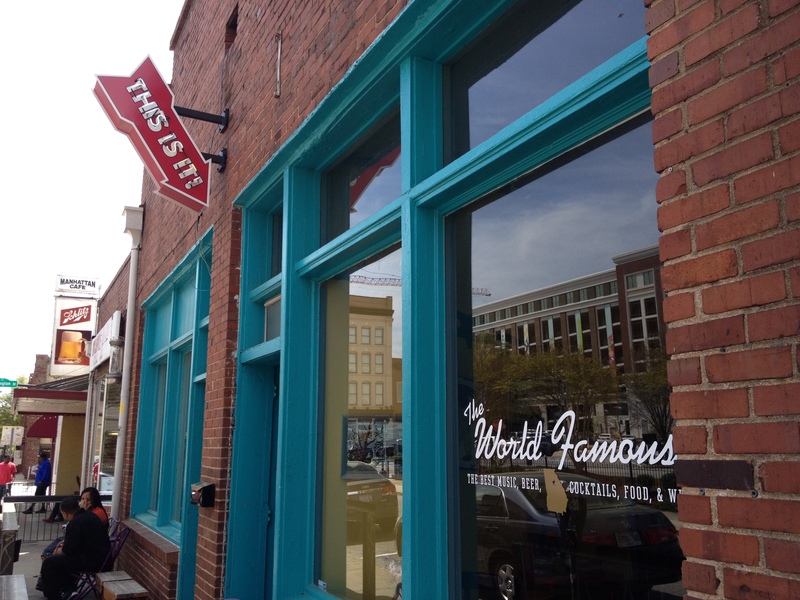 A lunch spot to try is The World Famous. This is it. 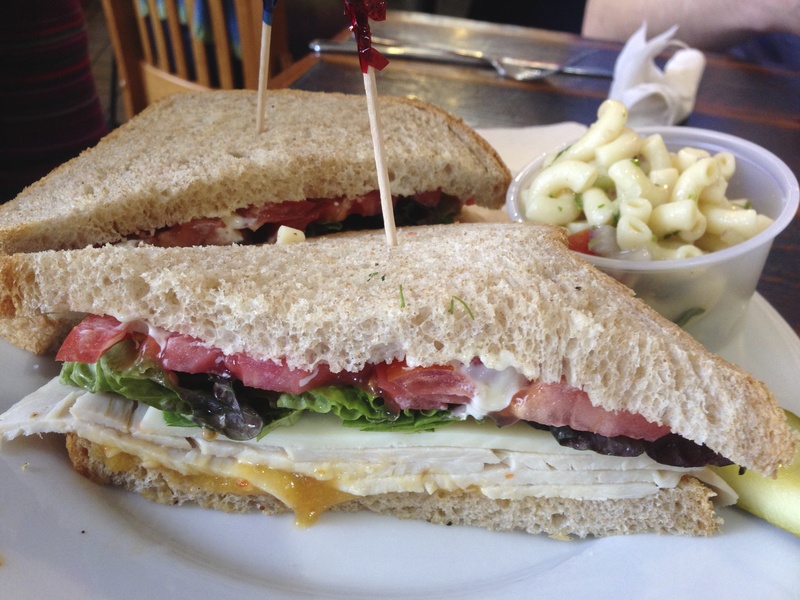 We are not sure what they are world famous for, but it might be this sandwich. The chicken and waffle club is just as advertised. The waffles make up the “bread” portion of the sandwich. 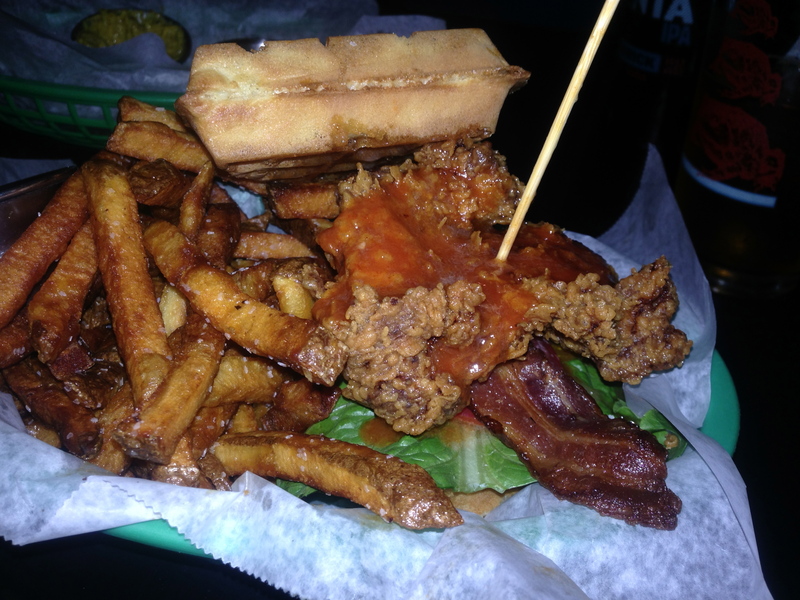 Inside is fried chicken, bacon, lettuce, and tomato. The whole thing is topped with bourbon maple syrup. This is one of the best sandwiches ever. Order this and experience nirvana. 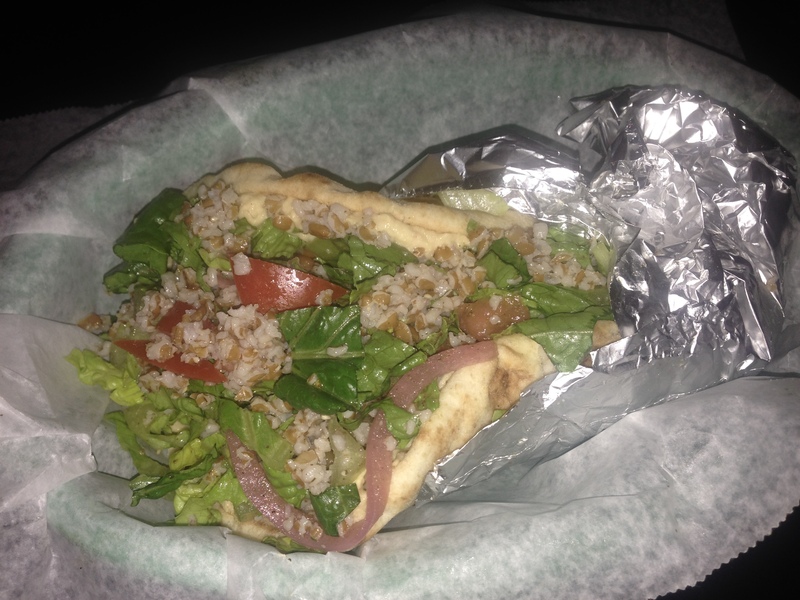 Or you can order one of the wraps on the menu. These sandwiches are large, messy, sloppy, and totally delicious. University of Georgia football great Herschel Walker has become quite the food magnate now that his football career is over. 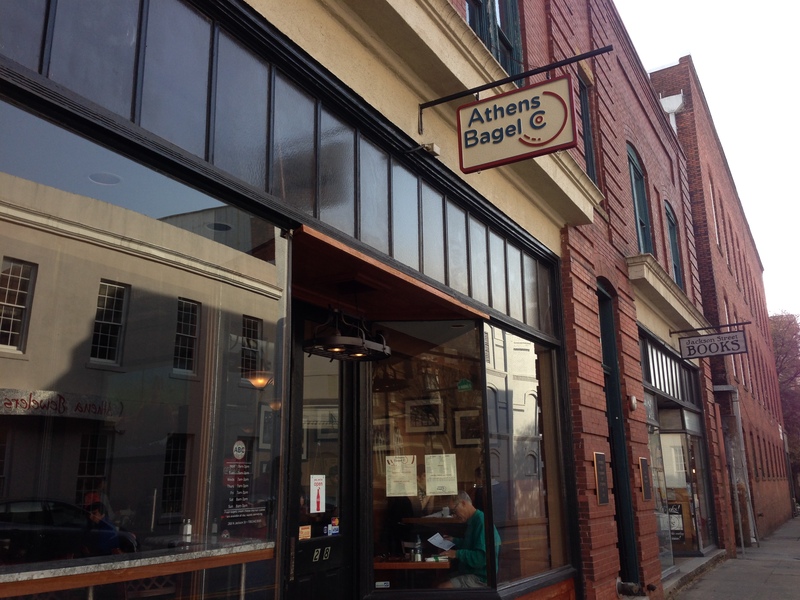 Walker owns farms and slaughterhouses in Texas and this restaurant in Athens. We think he wants to go national with the concept, but if he can’t make it in Athens, he might have a problem with the rest of the country. The students don’t love it here as evidenced by the low Urbanspoon rating. We will try not to “pile on” the criticism as that’s a 15-yard penalty. We go for a lunch visit (party of 7) to check out the menu. Even at lunch the portions here are huge. Be prepared to share, or take home the leftovers. The shrimp and grits come on a bowl of cheese grits. 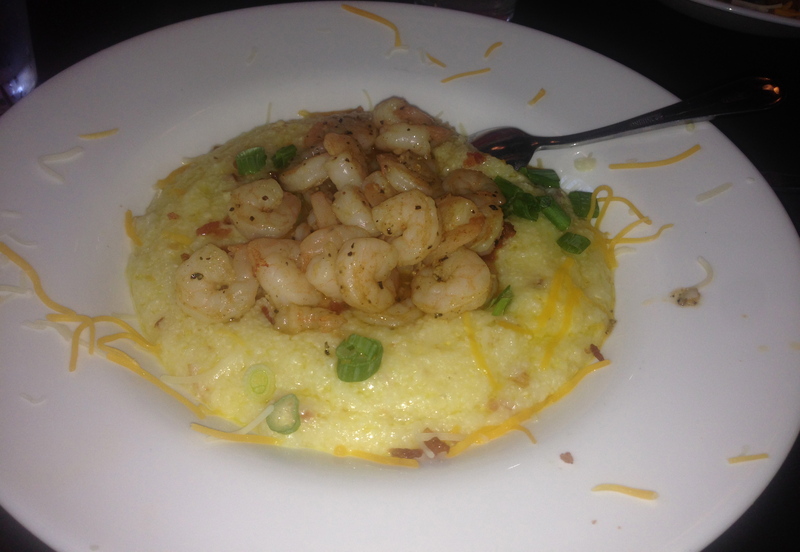 The shrimp is reported to be good, but the grits are described as too salty by two of our diners. 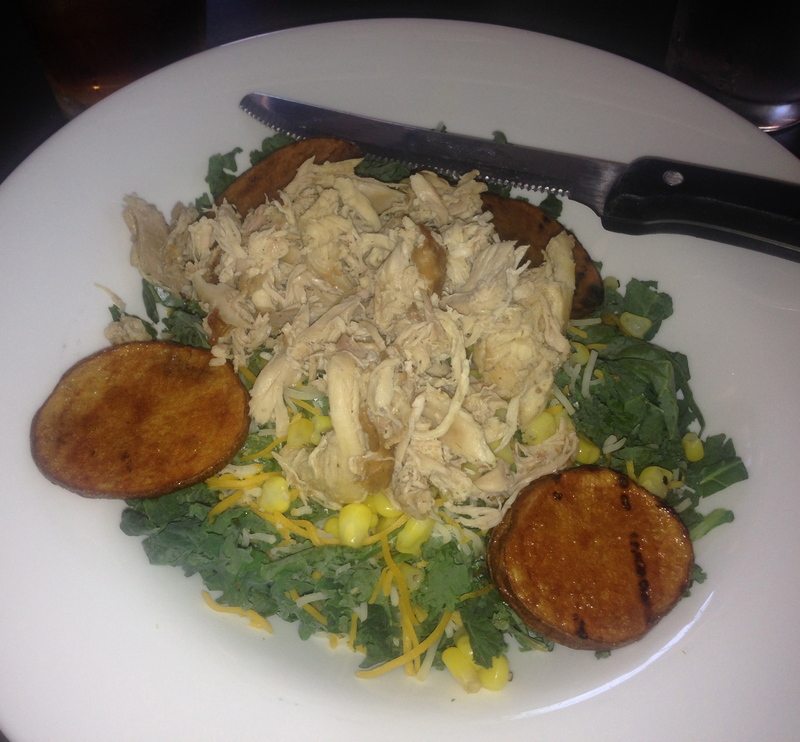 The chopped kale chicken salad features a generous portion of smoked chicken over a bed of kale, cheese and corn. The chicken is tender and perhaps a bit too salty. 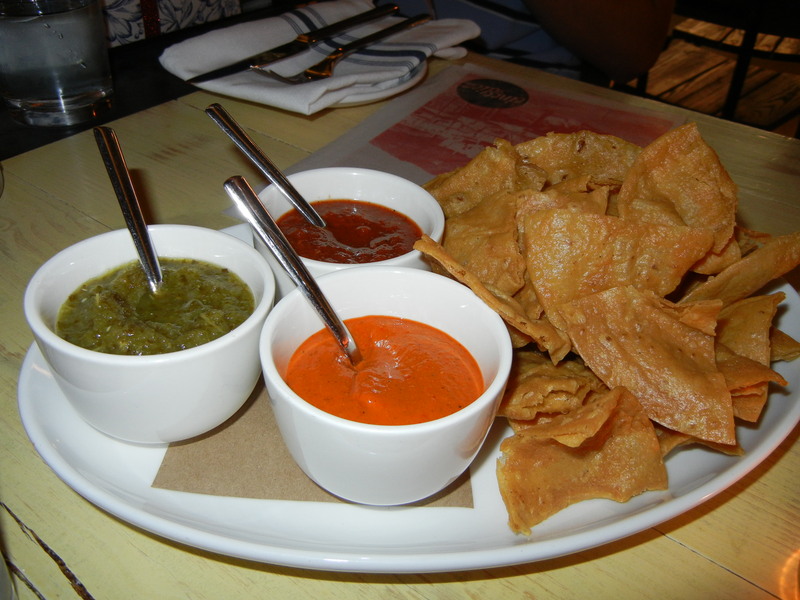 We order a side of fresh-fried kettle chips (not pictured), which may be the second-best thing that gets delivered to our table. 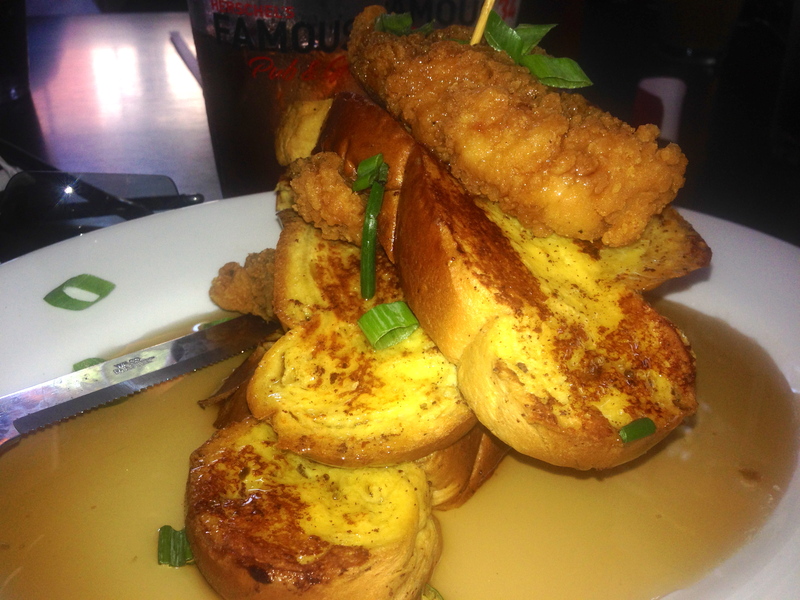 Behold Mama’s Chicken and French Toast. Although not as good as the World Famous chicken and waffles sandwich, this huge plate is tasty and filling. Don’t try to eat it alone, although I almost finished it. 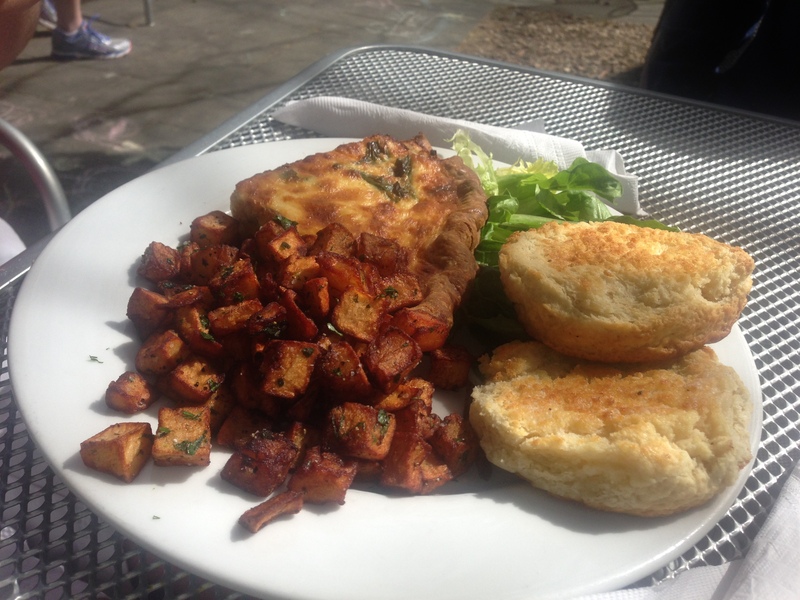 There are three pieces of french toast with three large, plump hunks of fried chicken breast. Then they drown it in syrup. If Herschel’s mother served him this dish, it would explain why he grew up to be the perfect physical specimen. Should you find yourself out and about at 2AM and you get hungry, there are a few places open to fill up with food instead of drinks. 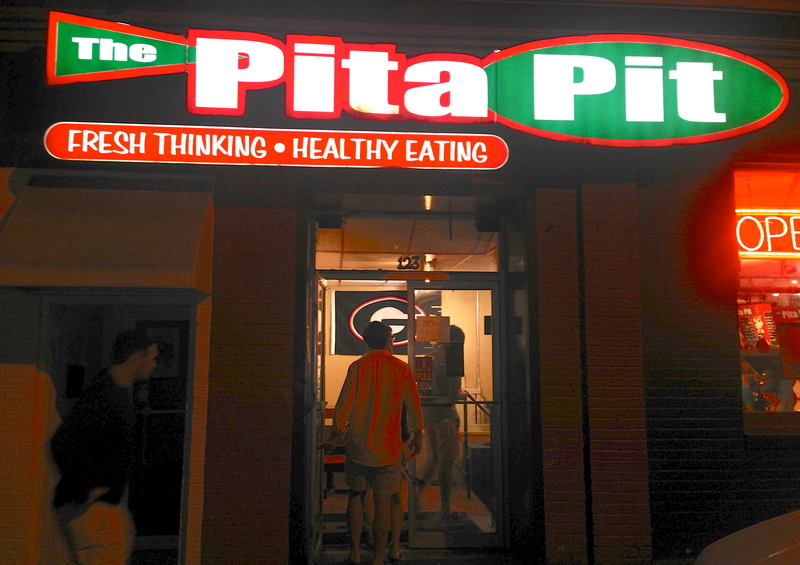 One of them is the Pita Pit. 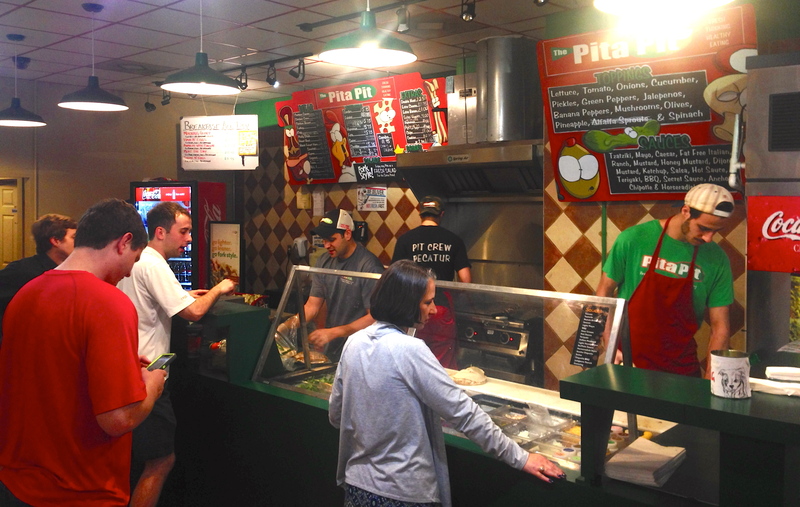 “It’s kinda like Subway, only better,” the dude behind the counter tells us. You really can have it your way here. We might be the only sober people in line. 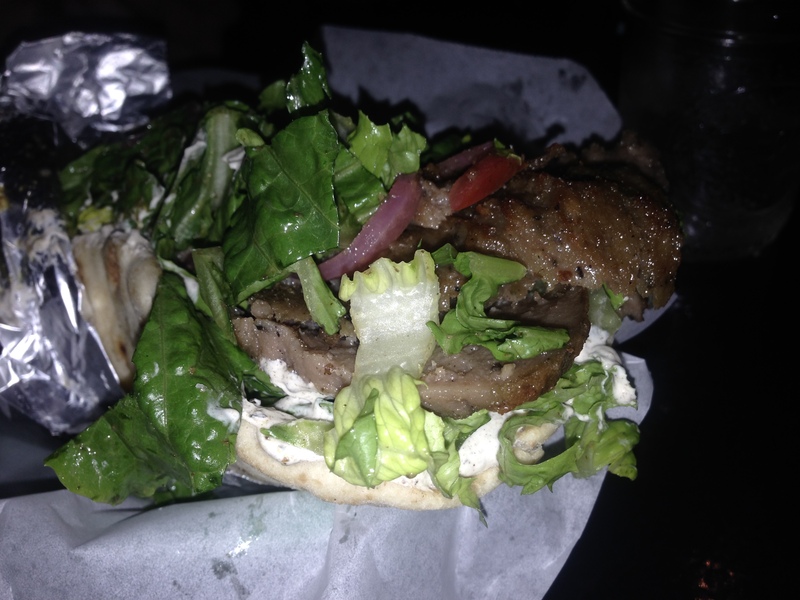 Actually, we aren’t that sober either, but when in Athens… They steam open your pita and you can fill it with anything you want. Then they roll it up to make it easier to handle. We start with falafel and go from there. They make the falafel while we wait and it’s hot and fresh. 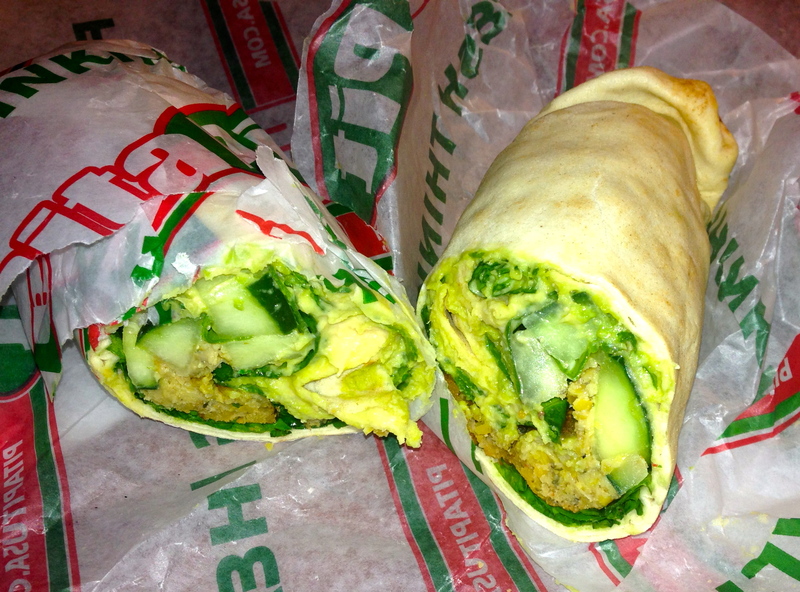 We put cucumber, spinach, hummus, avocado and olives in ours. They cut it in half and we wolf it down. This is much better than Subway and if you don’t feel like visiting at 2AM, they are open for lunch. 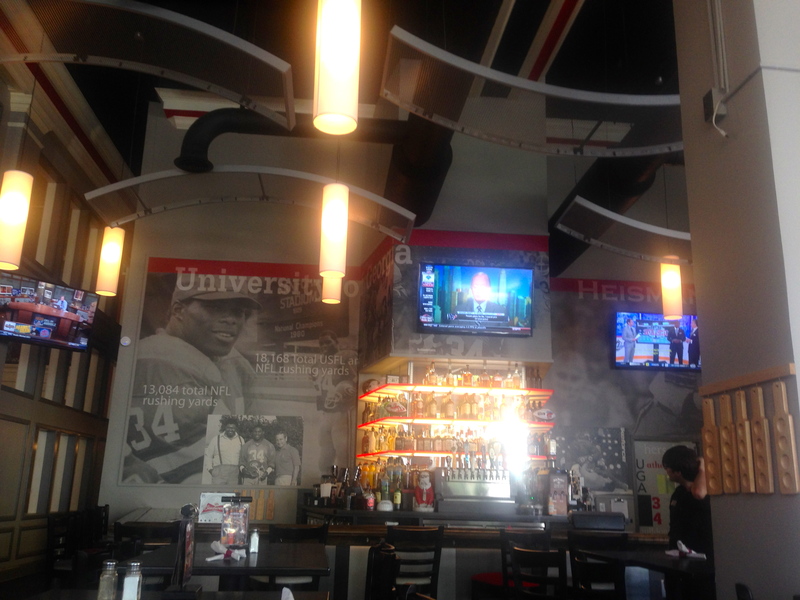 College towns and pizza joints are synonymous. 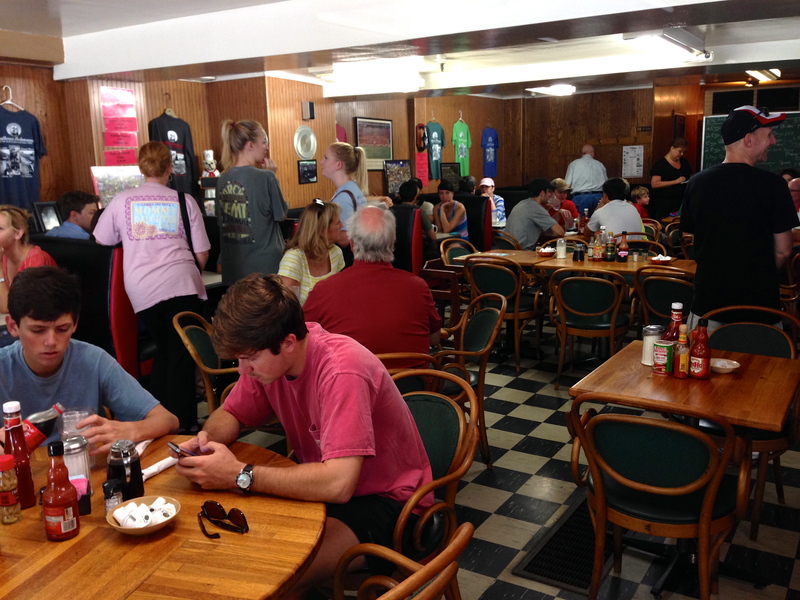 Some of the best pizza in Athens is at Ted's Most Best. You can read our review of Ted’s here. 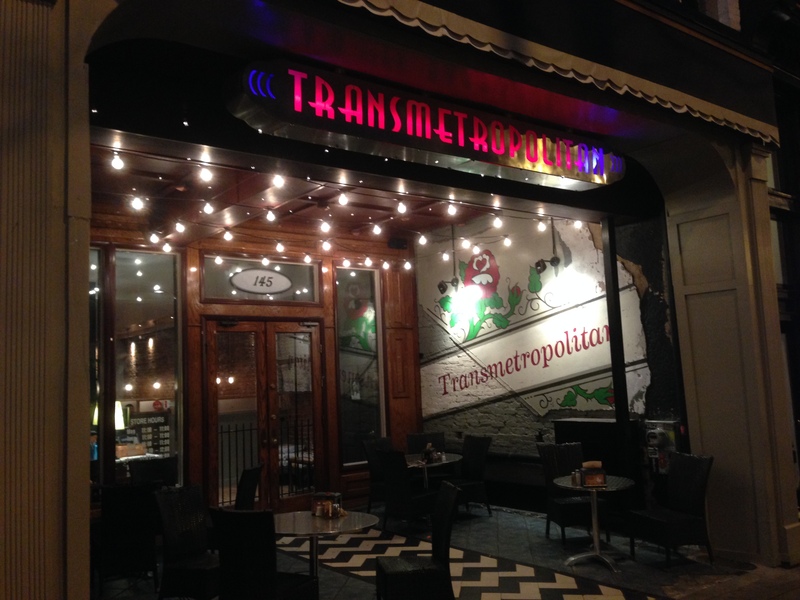 Another good pizza joint is Transmetropolitan. It’s a bustling place with a hipster feel. We decide on pizza with a salad. 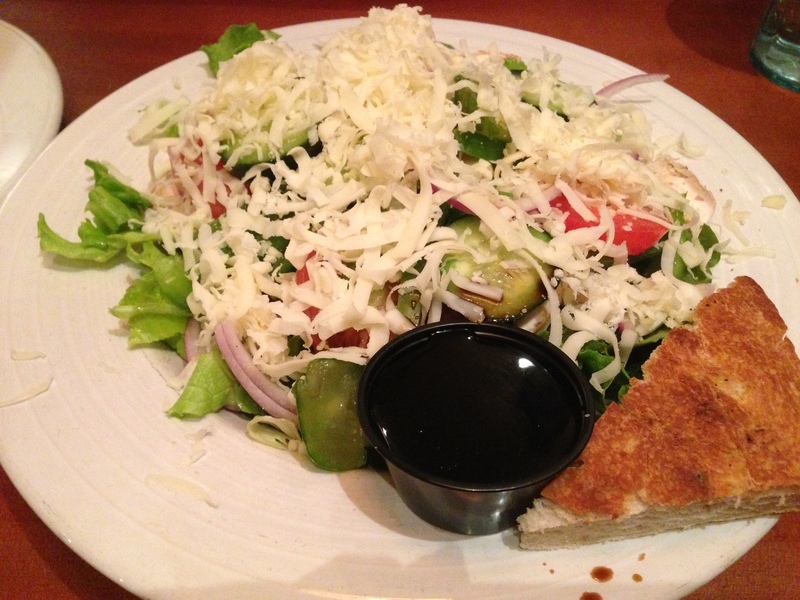 The salad is huge and is easily split among three people. For the main event, we go big and we go Sicilian. 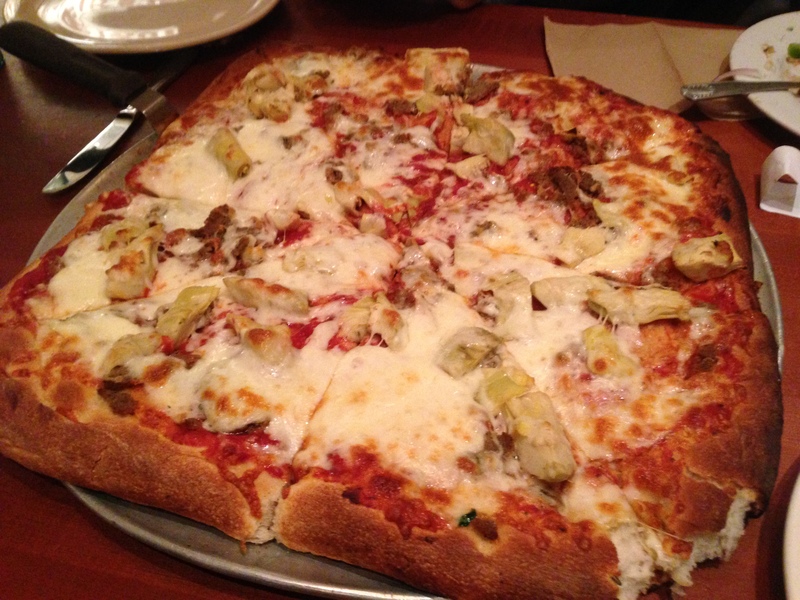 Artichoke and meatball pizza? Why not–they will make any combo you wish. Thin crust is available as well. We probably would have liked that better. It’s excellent pizza, but there is so much dough in the crust that we fill up quickly. Fortunately, we are able to send the leftovers home with our “starving” college student. 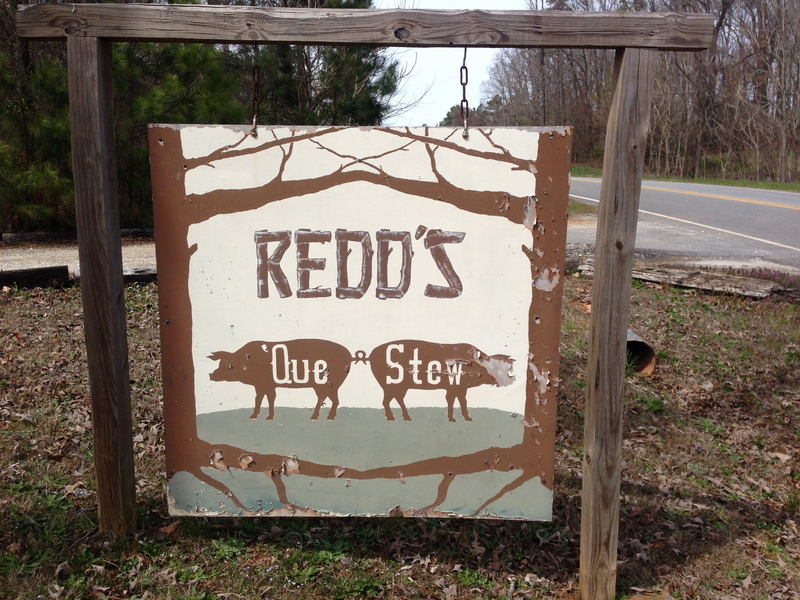 Twelve miles outside of Athens, in the suburbs of Nicholson, sits Redd’s Cue and Stew. Redd’s is in an old house on top of a hill. We pass Redd’s on the way to a bike ride and decide to return for lunch. This turns out to be an excellent decision. 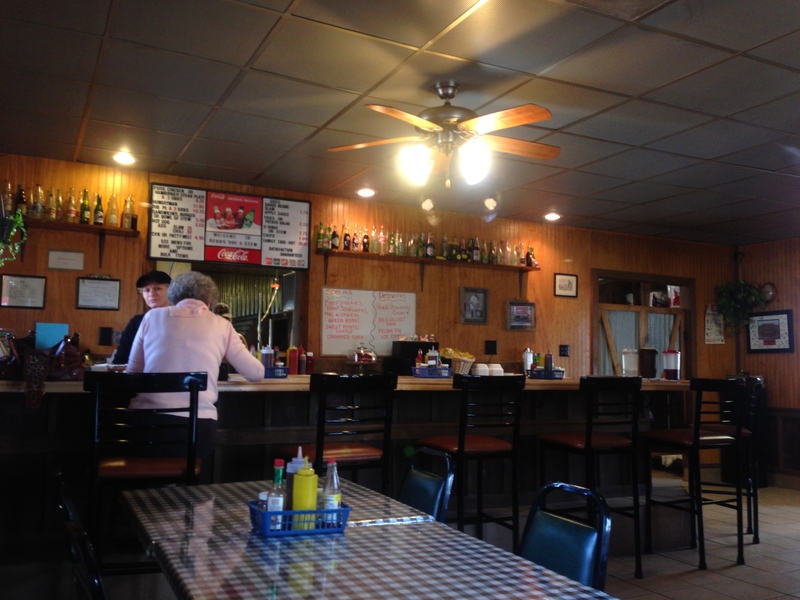 In a small BBQ place, everyone seems to know everyone else. They knew we aren’t “from around here”, but the staff and patrons are very friendly. They are cooking up some great food in the large smoker built onto the house. The pulled pork is moist with just the right amount of smoke. It doesn’t come sauced up–you get to put as much or as little as you want. The ribs don’t have a lot of sauce either. They are moist and meaty, just the way we like them. There must be something illegal in the creamed corn. It’s sweet and totally habit forming. 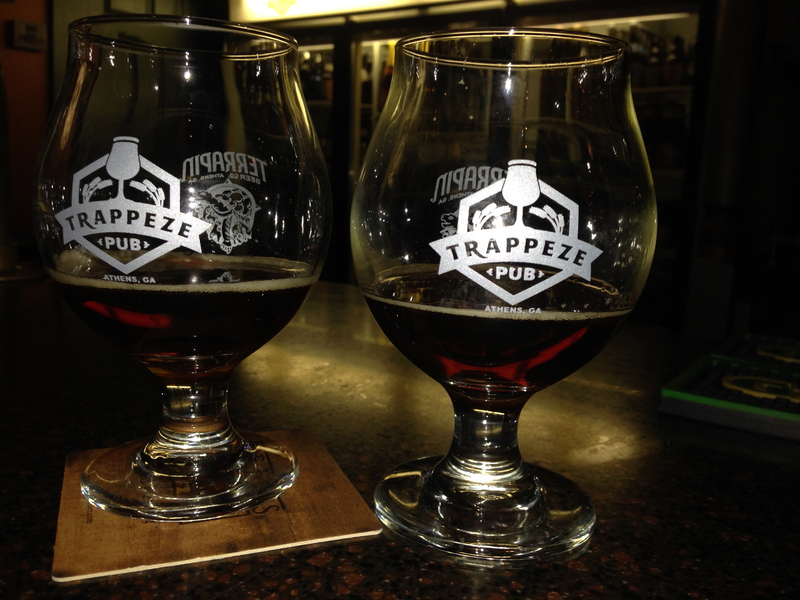 One of the best beer bars in Georgia is the Trappeze Pub. It’s our second favorite bar, right behind the Brick Store in Decatur. 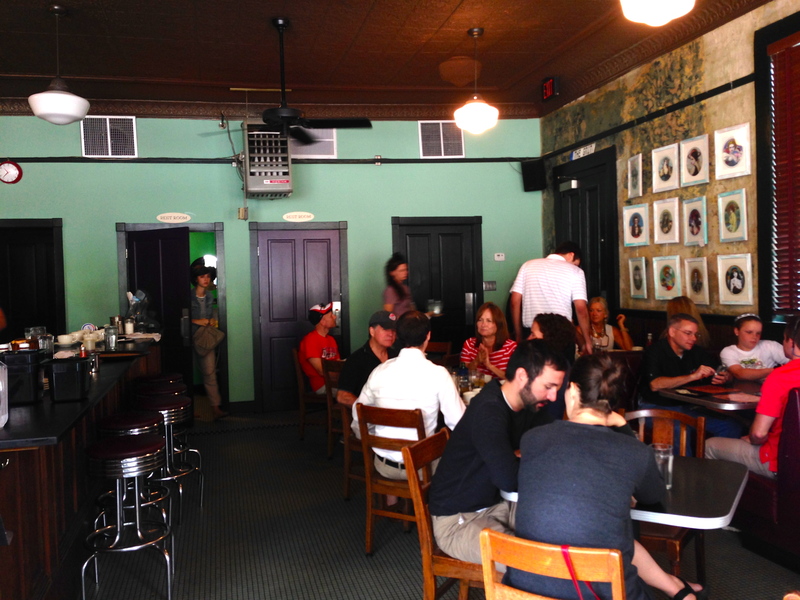 It’s a Belgian beer bar as well as a darn good place to get a burger or a sandwich. We go to Trapeze every time we go to Athens and the beer menu never fails to disappoint. If you are a hop-head, you have to go here. We like to sit at the bar so we can see what everyone else orders. There is no Corona or Bud Light on the menu. What a pleasure! On this visit, we are so happy to be here that we forgot to take pictures of our beers when they are full. We both got the same thing, the Sam Adams doppelbock that was over 10% ABV. We didn’t get any food this time, so we have no pictures of what’s on the menu. 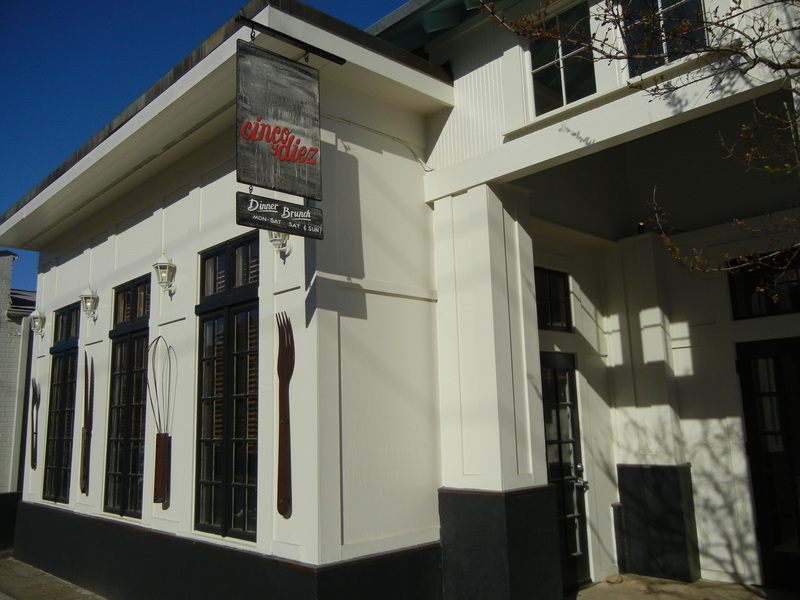 By the way, if you are looking for something a little more intimate, the Highwire Lounge is owned by the same folks and is right next door. 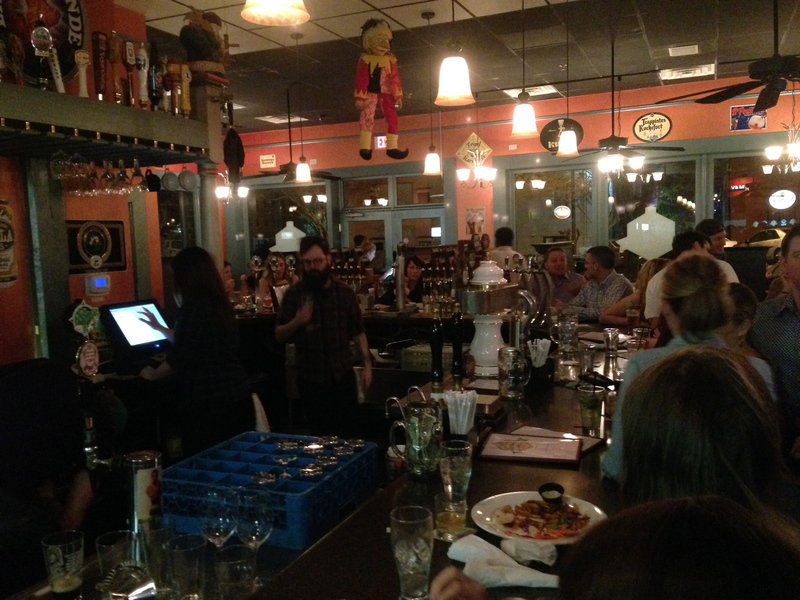 One of the more interesting restaurant concepts we have tried in Athens is the Five Bar. 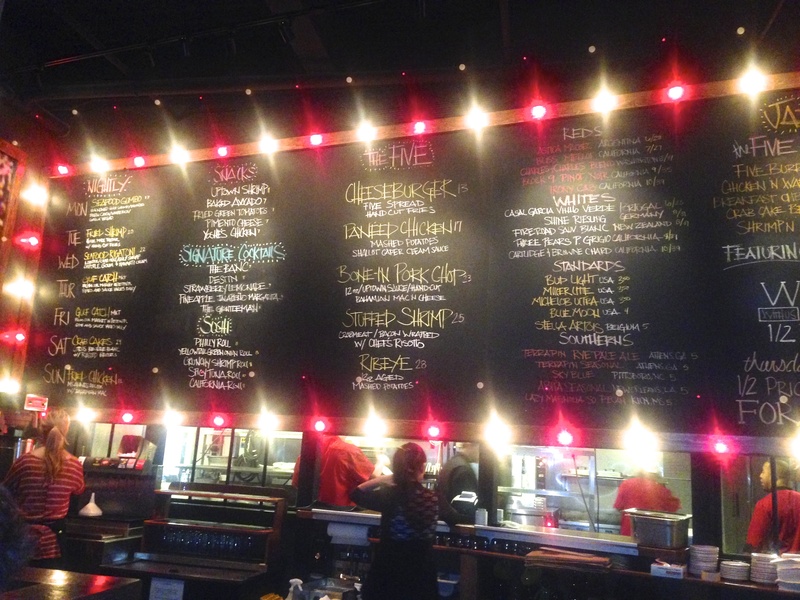 The menu is posted on the wall and changes all of the time. There are five of each category available every day. Five appetizers, five signature cocktails, five sushi rolls, five entrees–you get the picture. There are five red wines, five white wines, five crappy beers and five craft beers. The prices here are a bit higher than many places in town, which means you get a grown-up crowd. The students don’t hang out here unless their parents are in town. We start things off with a baked avocado. It comes with bacon and melted cheese, not the healthiest thing to do to an avocado, but it’s really good. If this is one of the five starters on the wall, go for it. The sushi is fresh and you get a lot to an order. Share with a friend. 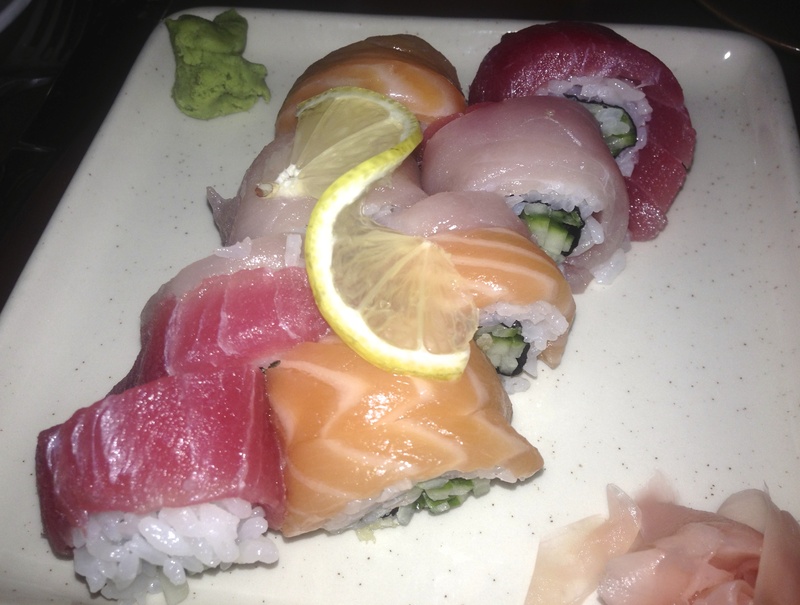 Check out this rainbow roll with large pieces of tuna, salmon, and snapper. Gorgeous. We got a roll that wasn’t on the five board. (Editor’s note: We visited in November and can’t remember what was in this roll.) I think we see some tuna on top. Nevertheless, this one tastes as good as it looks. The college student orders a burger, which looks out of place among the sushi. 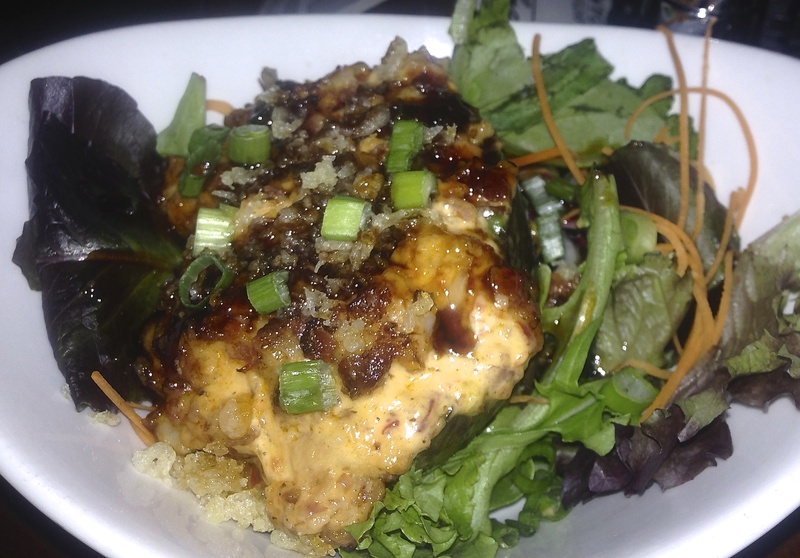 The Five Bar isn’t really a sushi place, they just have it on the menu. We do not get a bite of the burger, but the fries are excellent. One of the hidden secrets in Athens is Shokitini. The sushi is good, fresh, plentiful and surprisingly cheap. We eat a ton of raw stuff and hardly put a dent in our wallet. 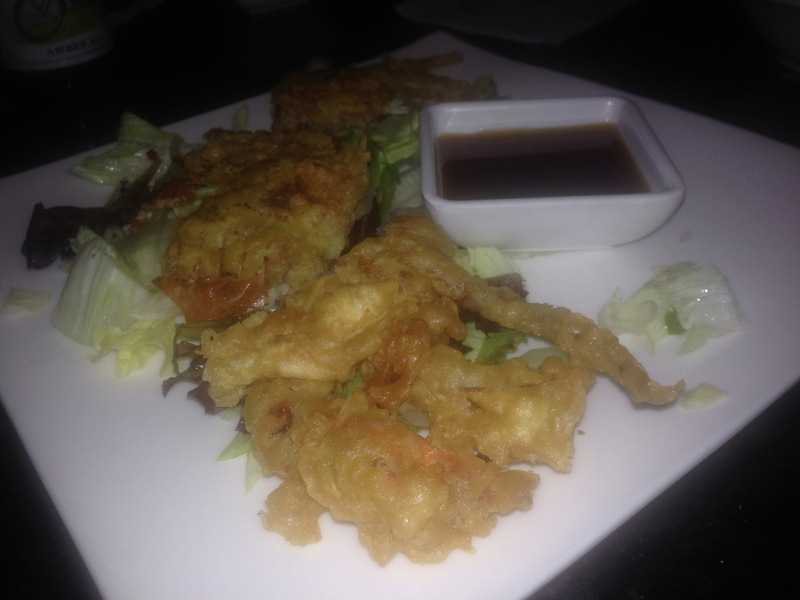 We begin with the soft shell crab tempura. Soft shell crab is great when it’s fried, and when it’s in a tempura, it’s heavenly. 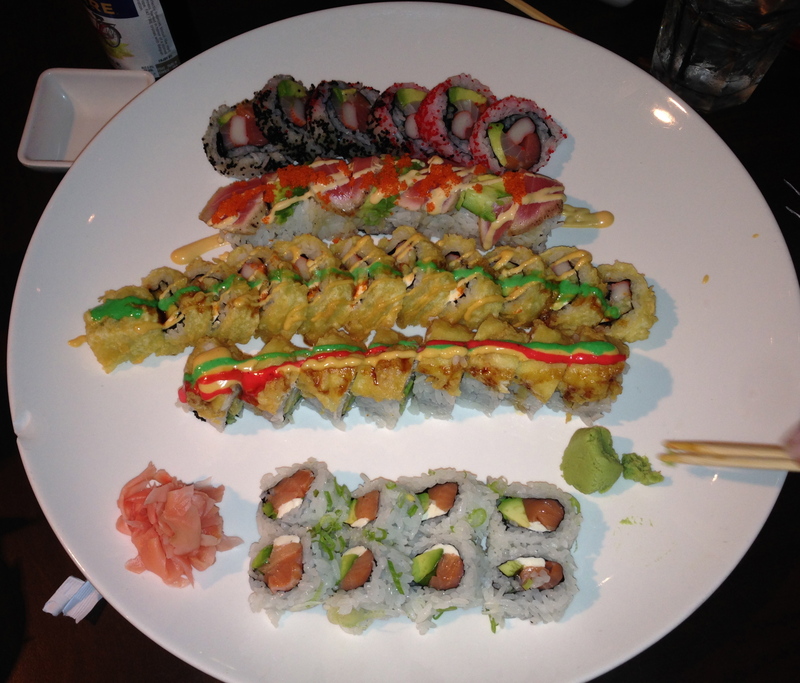 How’s this for a plate of sushi. We actually order a couple more rolls later. The great thing about the menu here is that you can go mild or spicy. 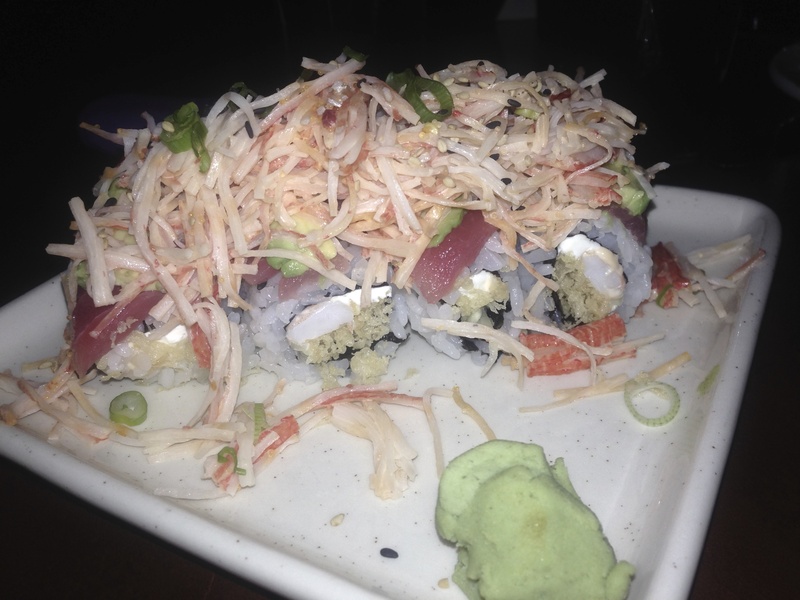 The TNT roll comes with wasabi mayo that packs quite a punch. There is such a good selection and variety that it’s hard to make up your mind. We shall go back for a further sampling. You might want to sample tonight’s dessert, fried Oreos. 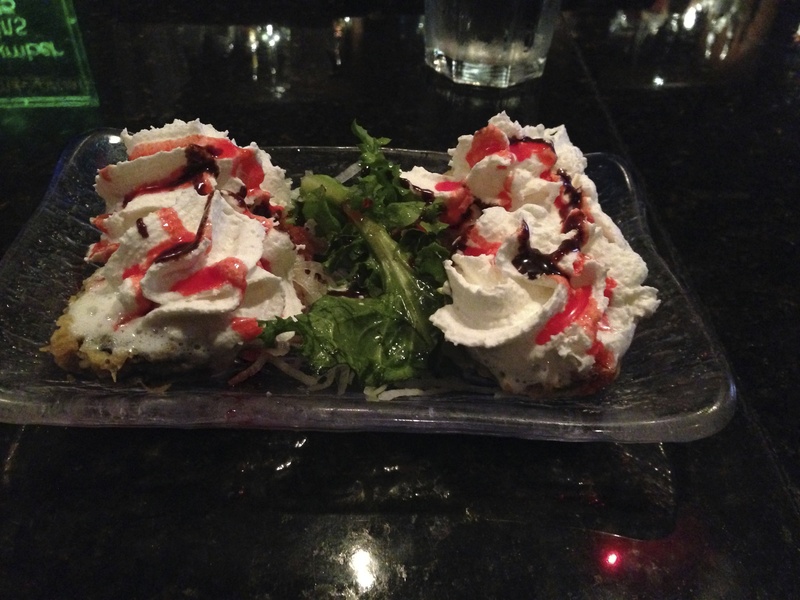 They fry the Oreos, and then serve them warm with whipped cream, chocolate, and cherry sauce. There’s just something about taking a dessert as healthy as Oreos and making it even worse for you. When it tastes this good, you just don’t care. 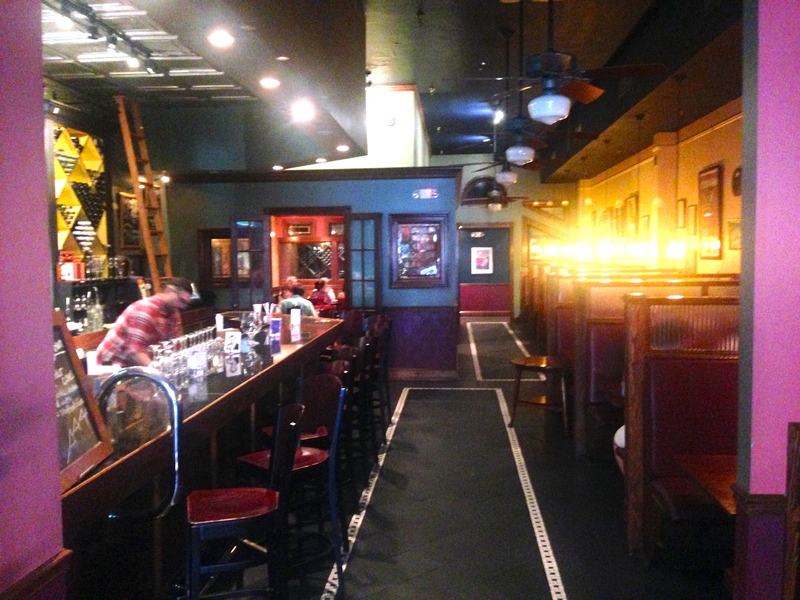 DePalma’s is on Broad Street, right in the middle of Athens’ main drag. 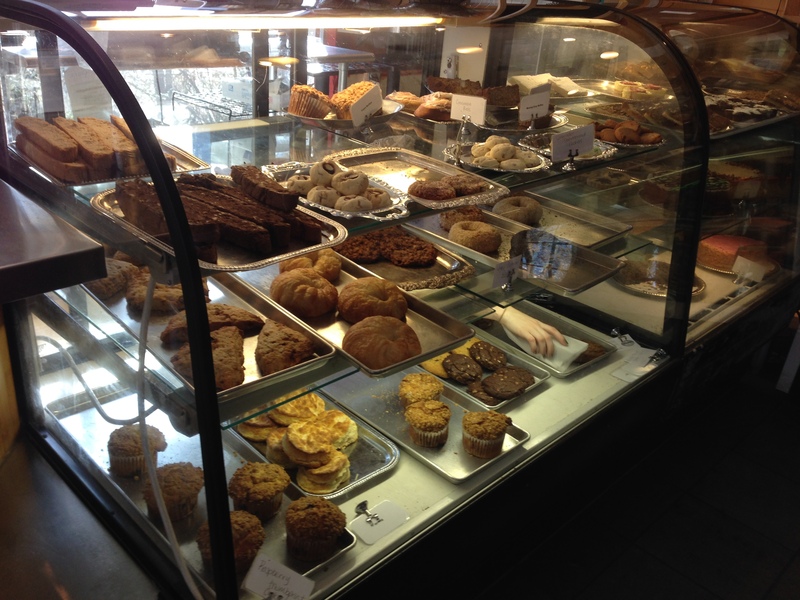 If you are looking for a place to “carb up” before a big bike ride, this is it. 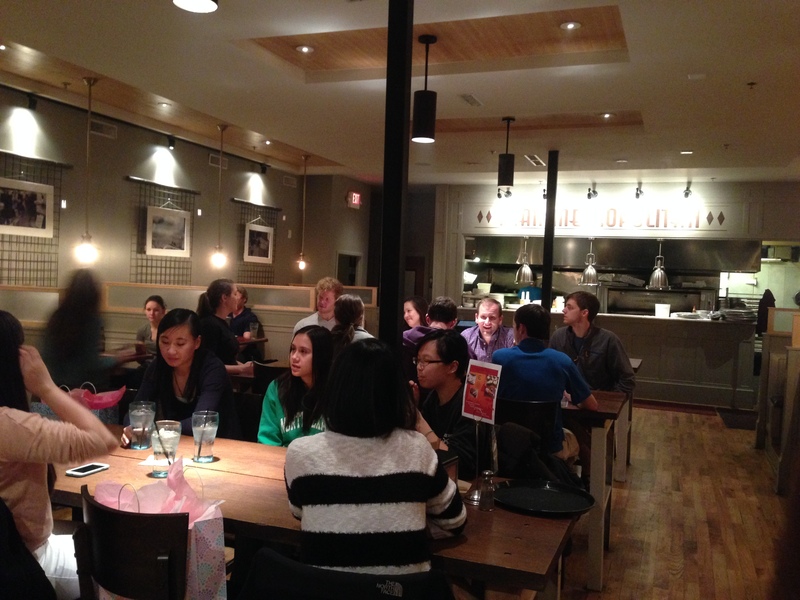 We visit with a party of seven, and they have no problem handling the large tables throughout the restaurant. Like many other restaurants in the area, the portions are huge. Remember this when you are ordering appetizers. We over-order on our appetizers. 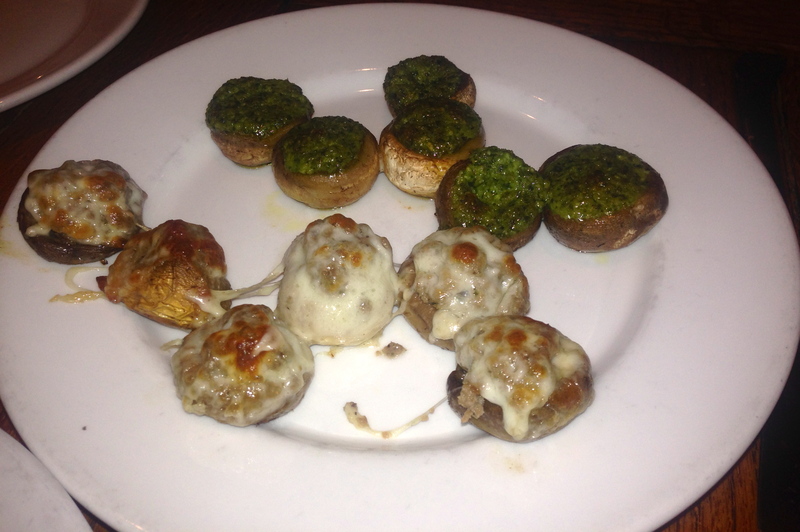 The stuffed mushrooms come with pesto inside of half of them and cheese in the other half. This is a nice, light appetizer that’s easy to share. 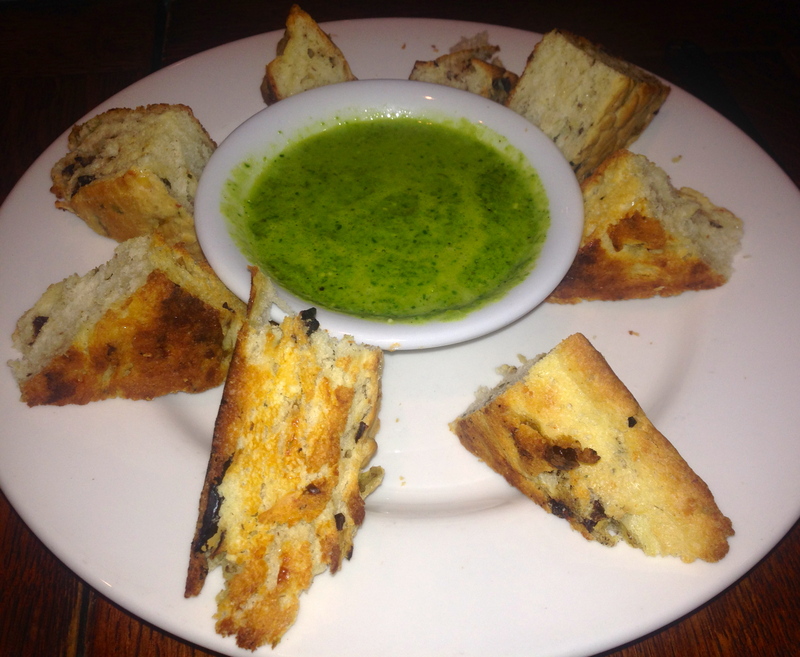 We also order the foccacia, which comes with a spinach-pesto sauce. Since they bring you bread to your table, you can probably avoid having bread with your bread. It’s good, but we would have been better off just eating the bread on the table. The menu is classic Italian, with pastas and pizzas playing a prominent role. We did not taste everyone’s dinner, but we took some nice pictures so that you can get a feel of what to order. 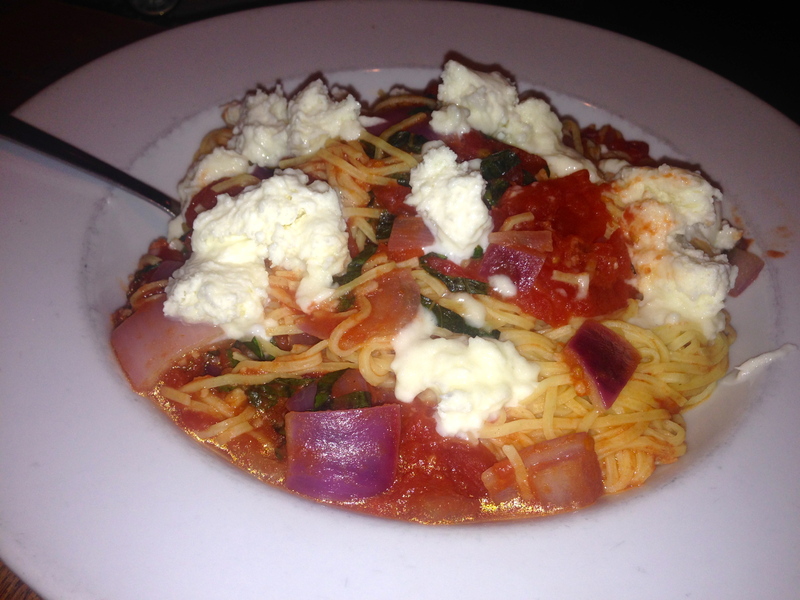 The pasta margherita comes with fresh mozzarella in a white wine and garlic sauce. 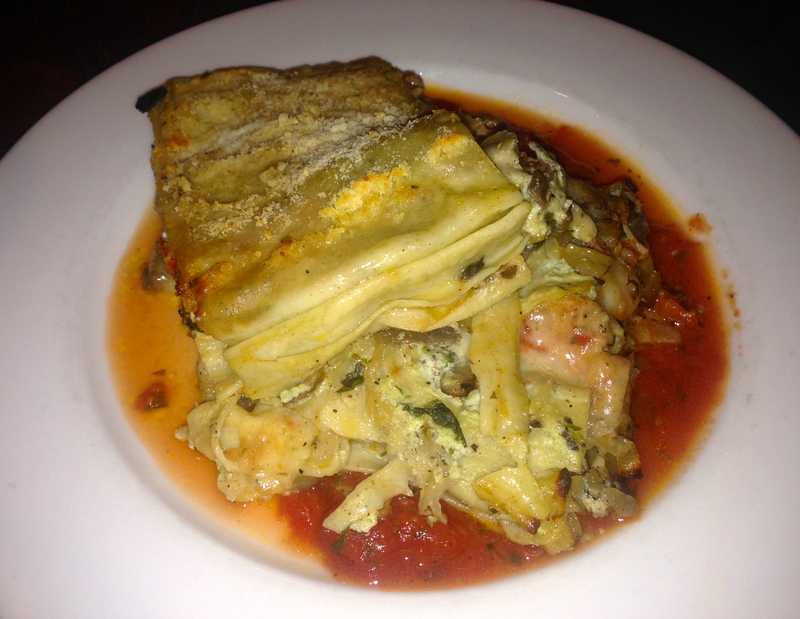 This lasagna is tonight’s special. It has sausage, onions, and peppers in it. A more traditional lasagne is also available. Here’s another special. 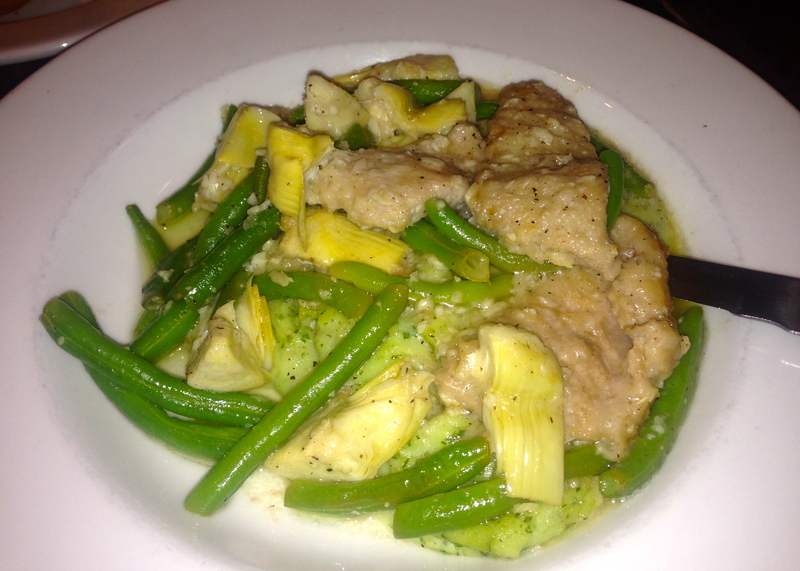 The veal comes with green beans and artichoke over spinach mashed potatoes. The veal is tender and has a nice lemon flavor to it. The mashed potatoes are a bit garlicky for my taste, but overall this is a successful dish. My date helps me eat this, and some goes home with a starving college graduate. He’s not starving after eating here. 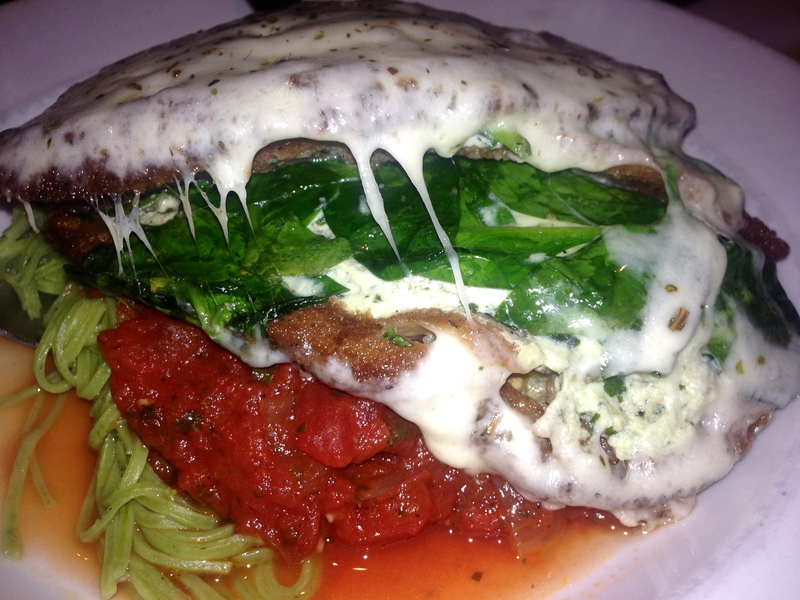 The eggplant florentine is a huge plate of eggplant parmesan with spinach added. It’s all served over spinach pasta. Molto benne! This is the best thing we eat tonight. 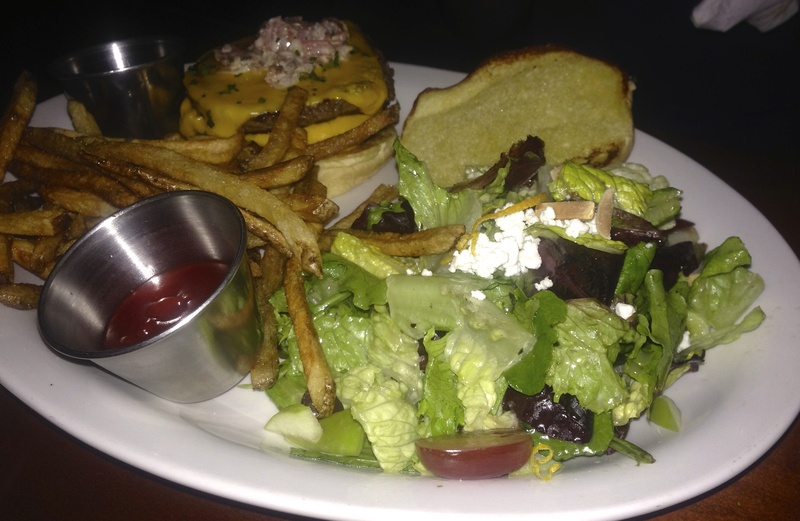 It is a very large portion, which means you are going to want to share it with your date, unless you are really hungry. Cinco y Diez opened a few months ago in the space where Five and Ten used to be. Five and Ten moved down the road apiece to new digs. With Cinco y Diez (“five and ten” in Spanish–get it? 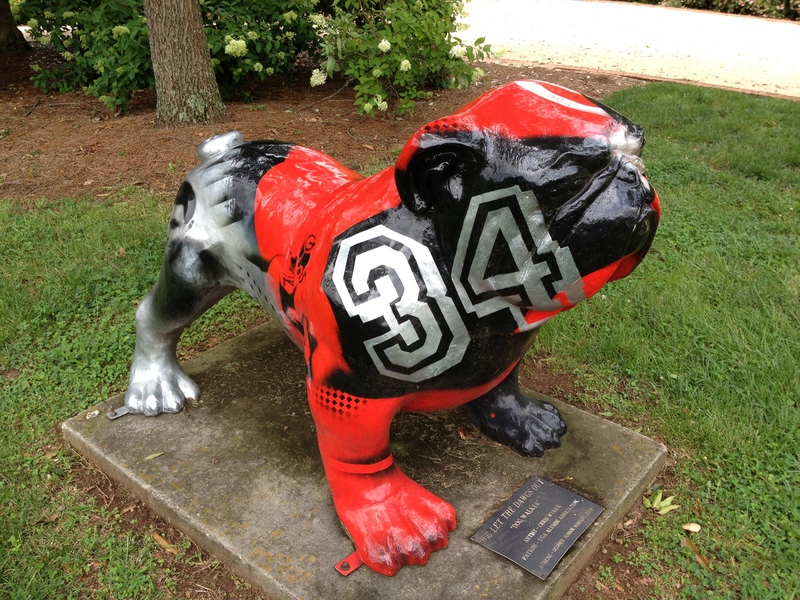 ), we complete the “Acheson Trifecta” in Athens. The first thing we order is the guacamole. We also get chips and salsa. 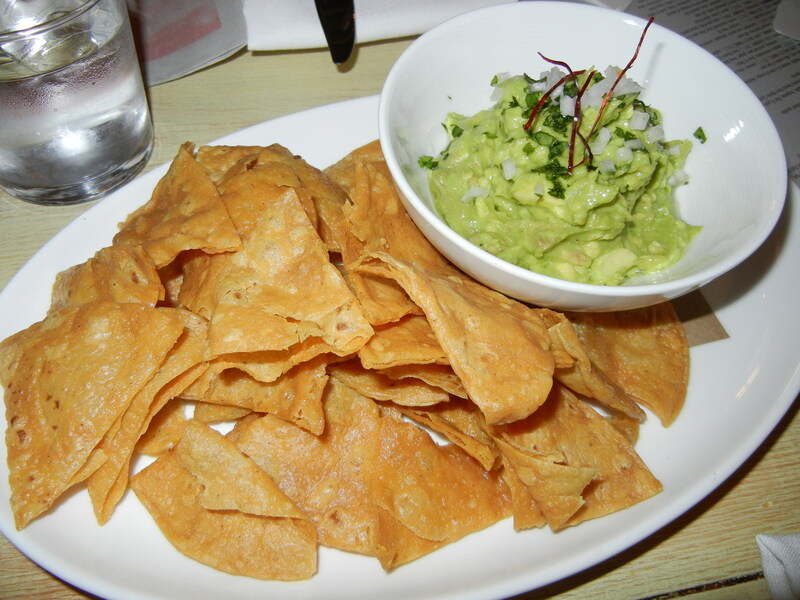 You have to order these just for the tortilla chips. They fold the tortillas over before they fry them to get a thick double chip. It stands up to all toppings and is twice as good as a regular chip. Tortillas are my weakness, and these do not help it at all. The chips kept coming and it was hard to control myself. This is one of those places where college kids take their parents when they come to visit because the students can’t afford it. We are with a party of 7, celebrating our son’s 22nd birthday. We didn’t eat all of this food ourselves. I should have taken more pictures as the food is beautiful here. Here’s a shot of the pork carnitas, which arrive with orange/beer sauce and roasted carrots. I don’t get a taste of this, but the starving college student who ordered it really enjoyed it. 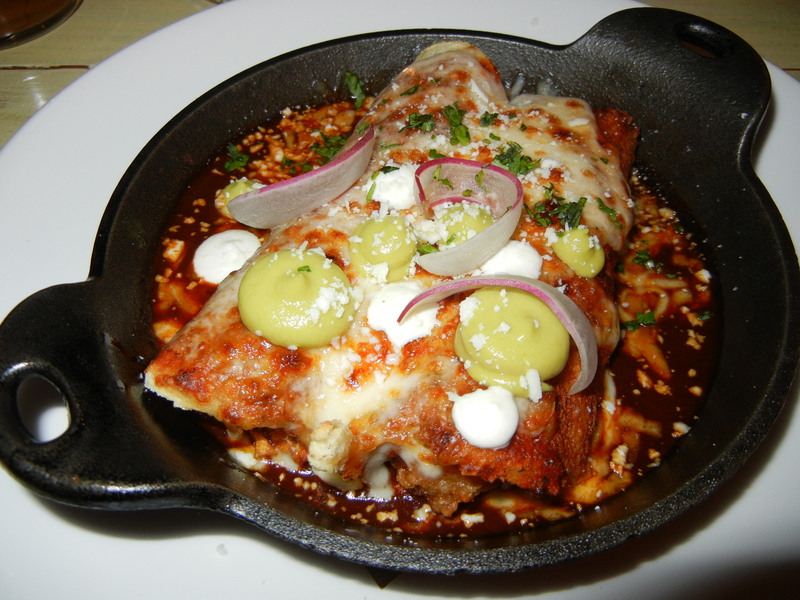 The fried oyster enchiladas are a special tonight and they are very special. 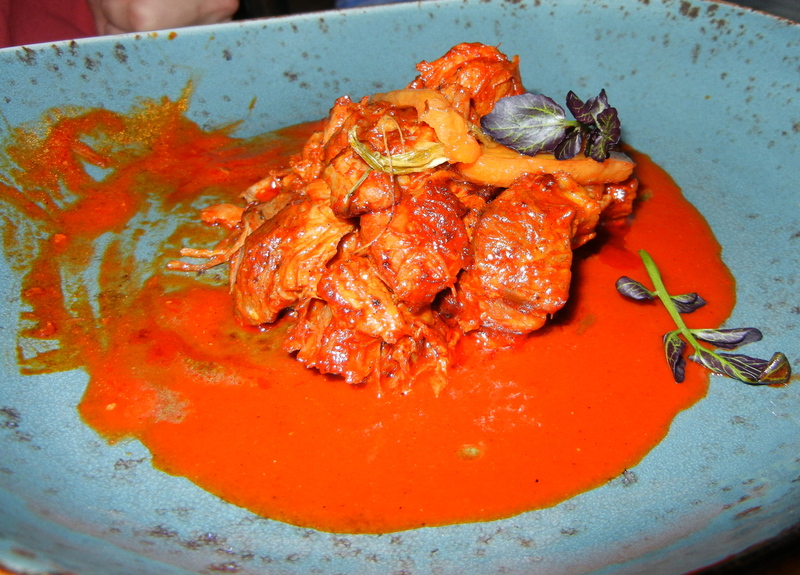 This is one of the best Mexican dishes this reporter has eaten. Props to the sous chef who came up with the idea. It’s neat that he whipped this up and suddenly they are the nightly special. The ribs are a special as swell. 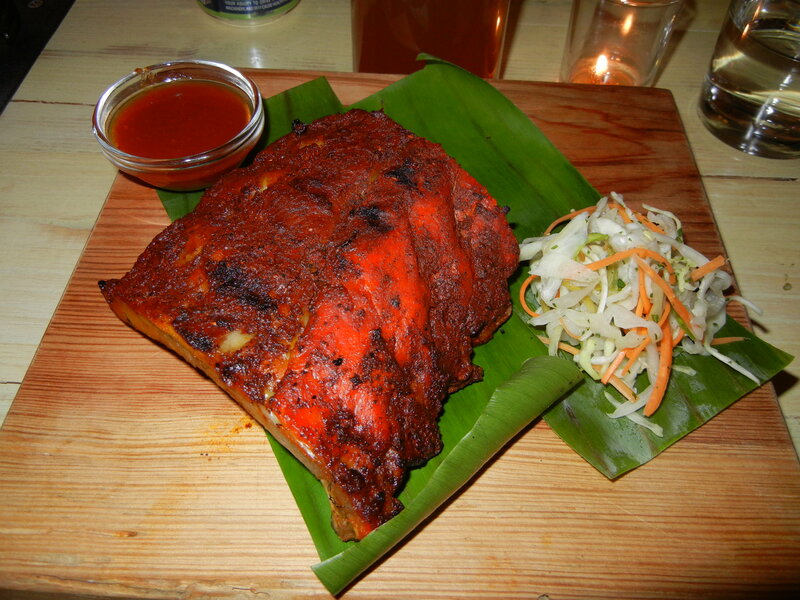 They are roasted in a banana leaf and topped with a fiery rub. They are spicy, but in a good way. They do not leave me sweating, which is where I draw the line on spice. Two desserts get photographed. 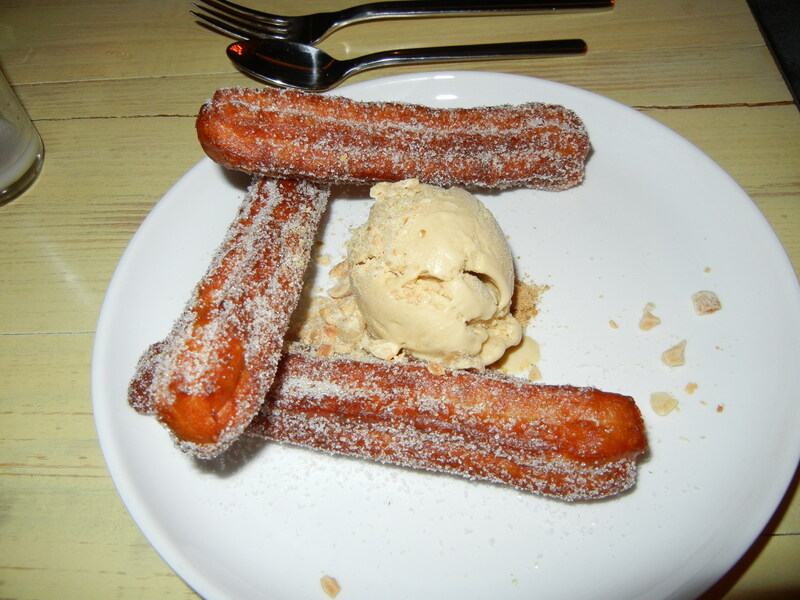 The churro is the traditional Mexican dessert. The fried dough is light inside of the sugary coating. The peanut butter ice cream has big chunks of nuts. 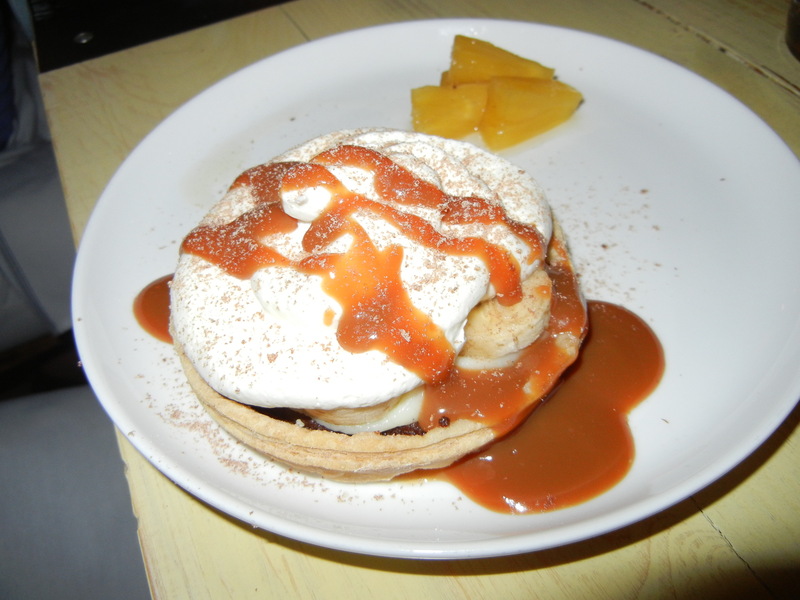 Finally, the banana cream pie. It’s a great way to finish an excellent meal. Acheson is batting 4-for-4 with his restaurants as far as we are concerned. We hope you have enjoyed our trip to Athens. It’s a foodie paradise and hopefully you are going on a road trip there soon.